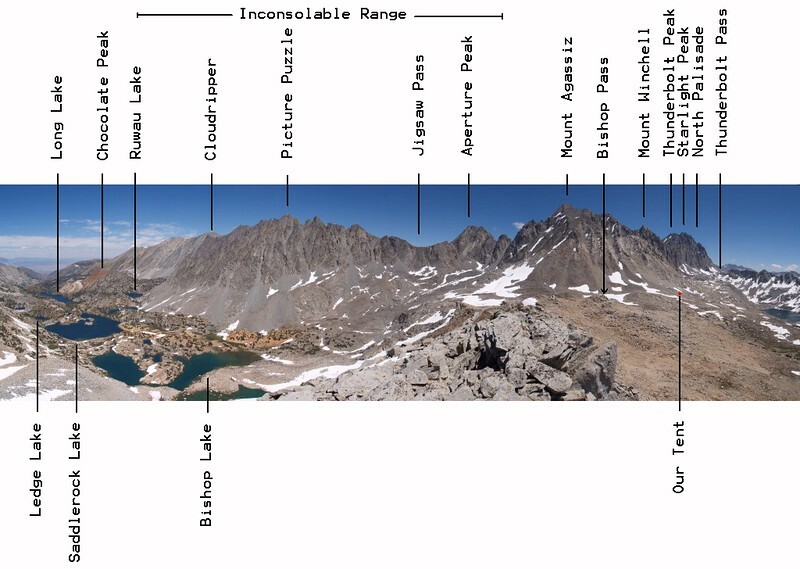 Day 1 Summary: Began hiking up into the Eastern Sierra on the Bishop Pass Trail from South Lake, elevation 9700 feet. 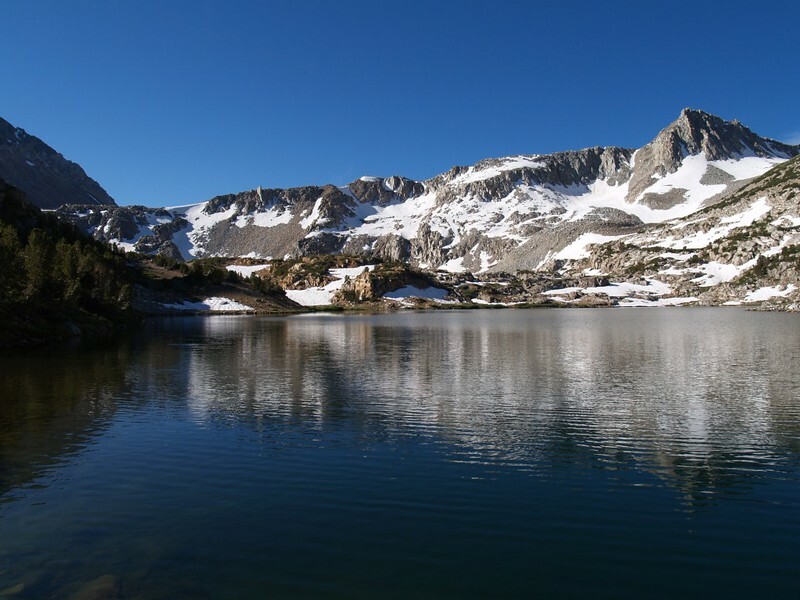 We camped at the upper end of Long Lake, elevation 10753 feet, nestled between Chocolate Peak, 11682 feet, and Hurd Peak, 12237 feet. We hiked a whopping 3.2 miles, but the campsite was so nice we didn’t care. The mosquitoes were mildly annoying. 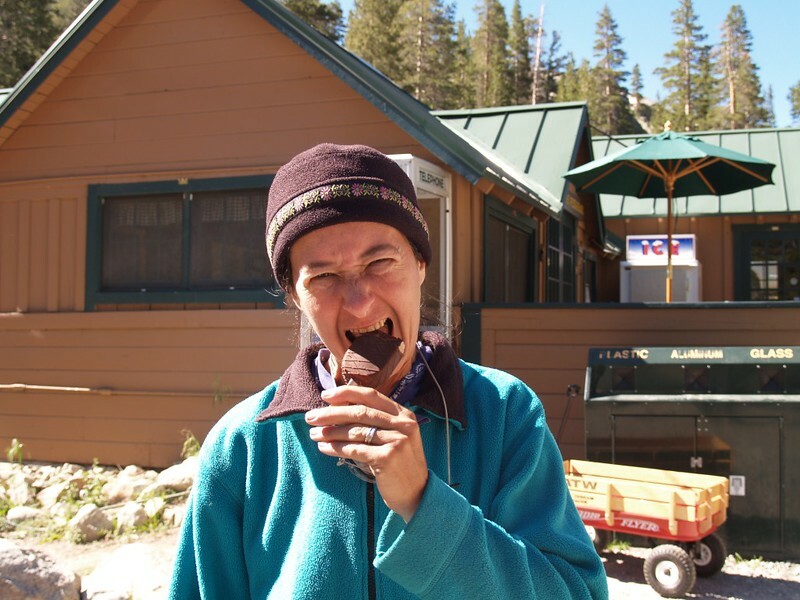 Now, the biggest issue of this hike was getting Vicki acclimated to high elevation. 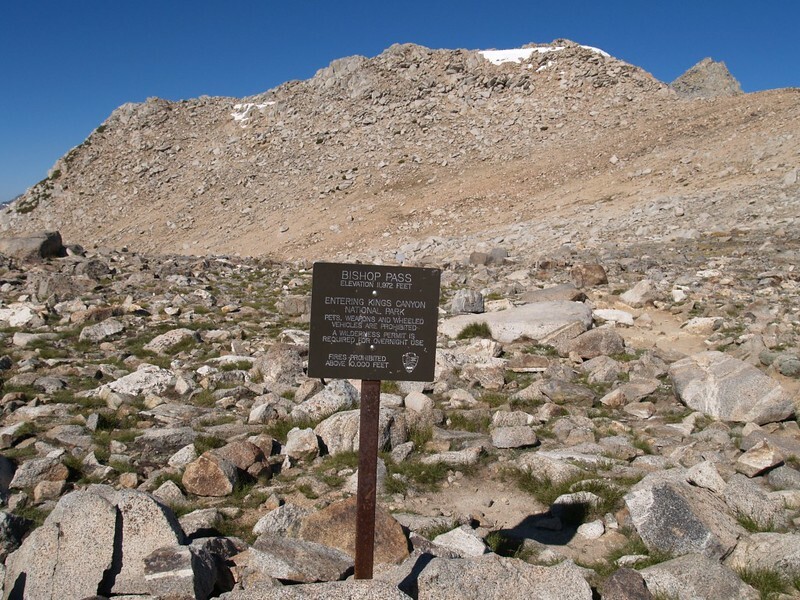 The trailhead was at 9700 feet, and after that the trail only rose higher. 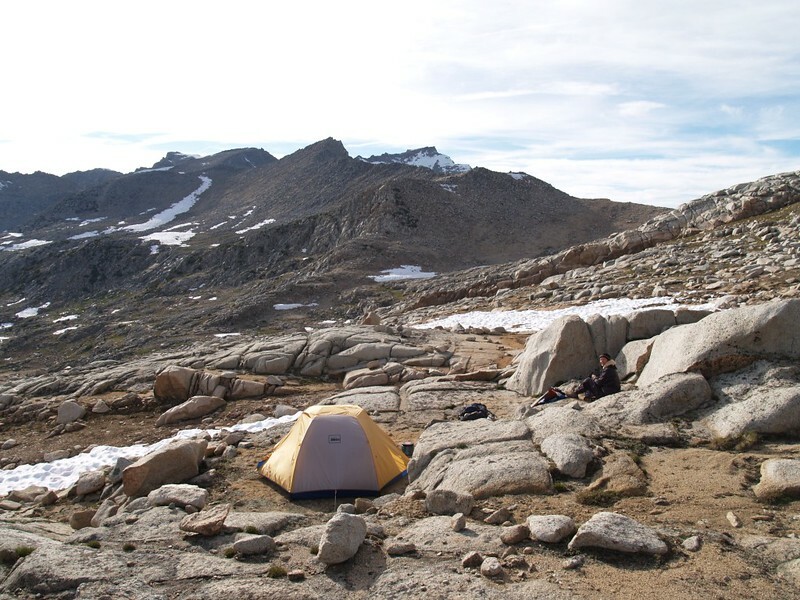 In order to get ready, we spent four days at at this same altitude closer to home, in the San Jacinto Wilderness. 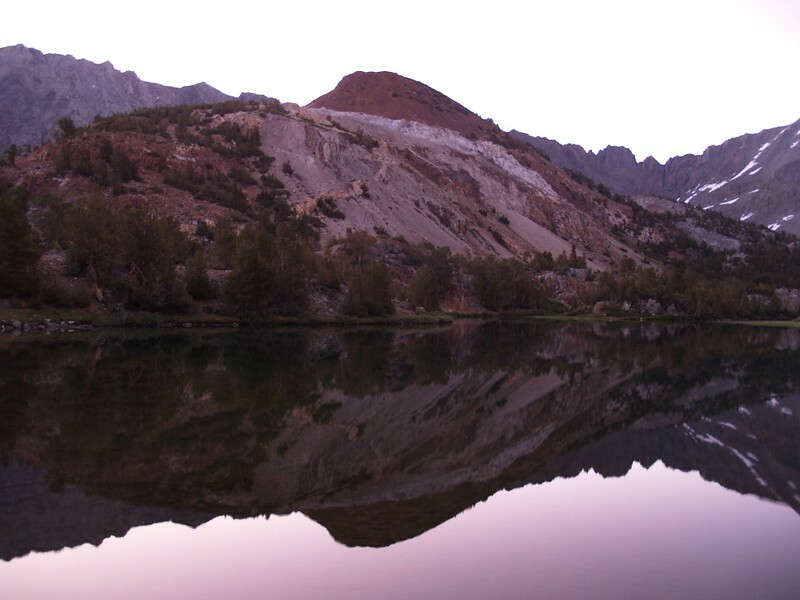 We came back home for three days, cleaned and re-packed our gear, then immediately drove north (all night long) to the eastern Sierra, where we stopped briefly in Bishop to pick up our wilderness permit. 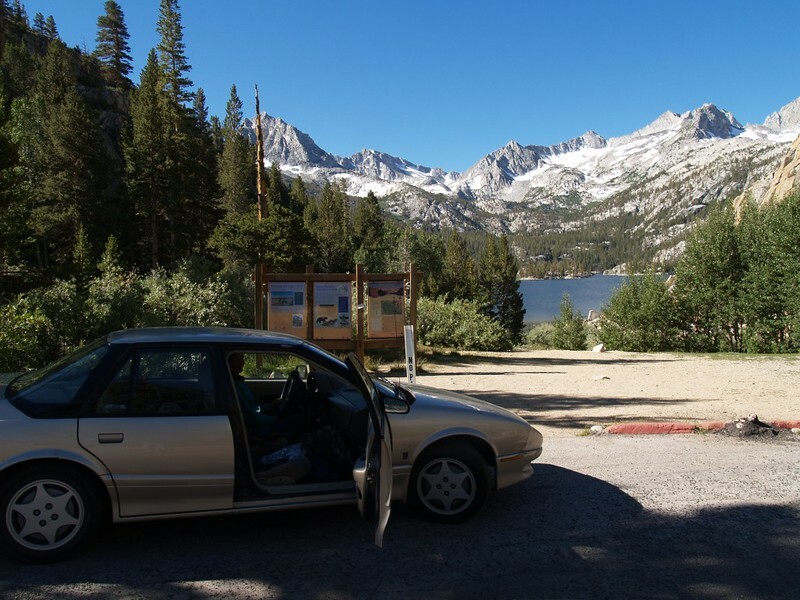 That accomplished, we drove west on highway 168, climbing ever-higher, until we arrived at the Bishop Pass Trailhead at South Lake. Amazingly enough, we actually found a parking spot in the lot there, and so we began hiking right away, even though we were quite tired. 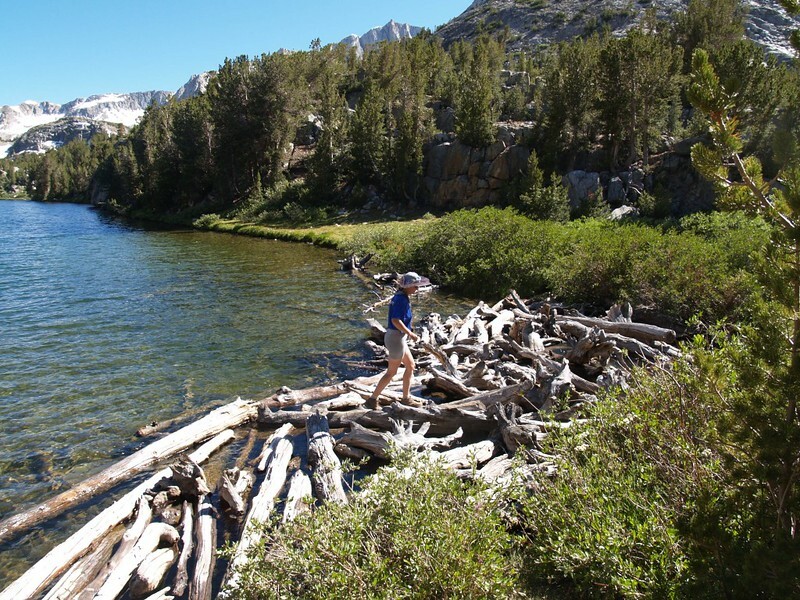 The trail climbed steadily along the eastern shore of South Lake. 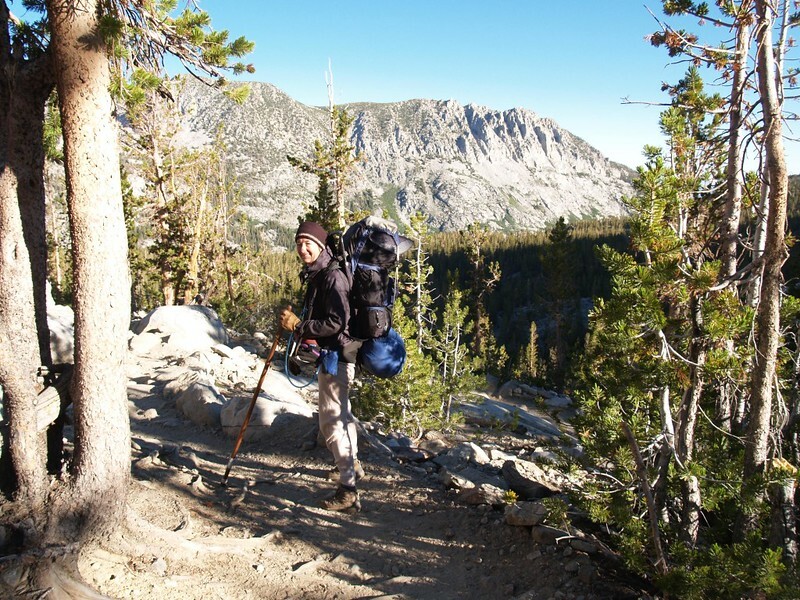 We passed the Treasure Lakes trail junction and hiked through the forest not far from Hurd Lake, which remained unseen from the trail until we reached a viewpoint. After that it was more steady climbing. 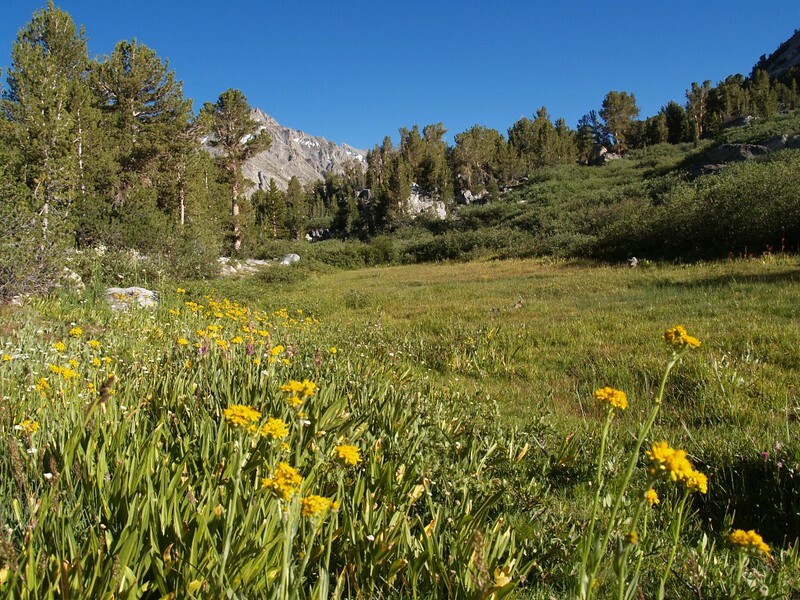 There were plenty of wildflowers along the trail, and the grasses were green and lush. 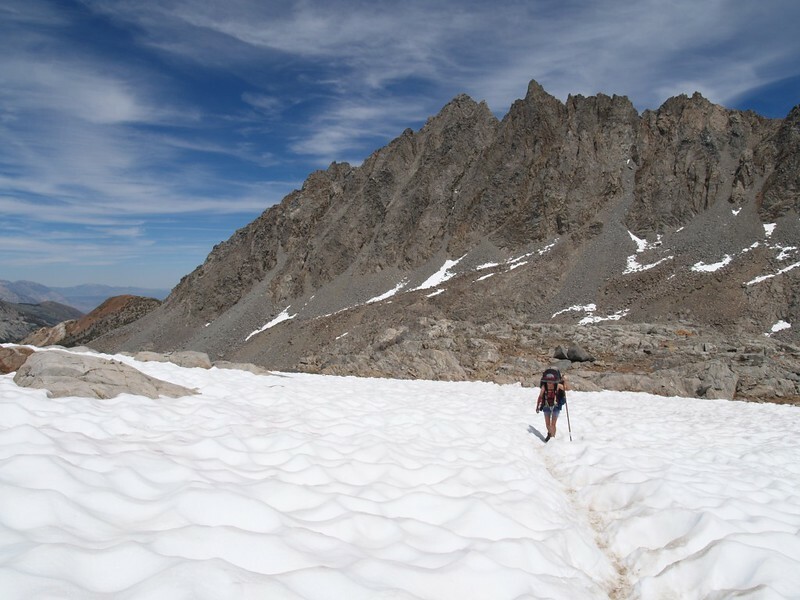 It had been a very good snow year for the Sierra, nearly double the average amount, and I had been worrying the previous month whether or not Bishop Pass would even be passable by now. I kept checking recent reports on the internet, and there were plenty of rumors of high passes full of snow and ice. People were saying that this July looked more like a typical June, melting-snow-wise, and that made me nervous. Then I was worried about mosquitoes. July was usually the month of mosquitoes, which was one of the main reasons why we always saved our big hike for August! But this August might be like a July for mosquitoes. And Vicki truly hates those biting bugs. So I had plenty of DEET insect repellent on hand, just in case. Eventually, we reached Long Lake, and it was beautiful. And it was truly long, about a mile or so. We walked along, taking photos and enjoying the rippling water and the blowing breeze. We reached the upper end of the lake and it was still early afternoon, but Vicki was very tired. She wasn’t anywhere near as well-acclimated to the elevation as I was. She was breathing hard and wanted to stop. So we put down our packs at a nice spot up on a promontory overlooking the lake, thereby claiming the spot. Then we sat under the trees in the shade and ate lunch. I wanted to keep hiking, as it was early and there were more lakes ahead of us, but Vicki was less than happy. And then I remembered the focus of our trip, which was to relax and have fun. After that it was easy to open my pack and get out the tent. We set it up and Vicki went inside, into the mosquito-free zone, where she took a nice nap. 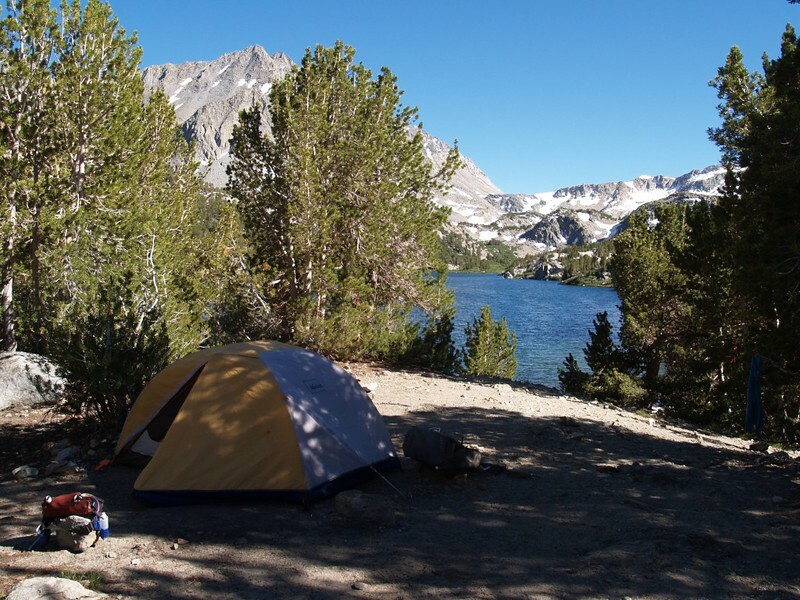 Our campsite at the upper end of Long Lake – What a great view! Later on that afternoon we day-hiked up the trail and viewed Spearhead Lake, which actually looks like a stone spearhead on the map. 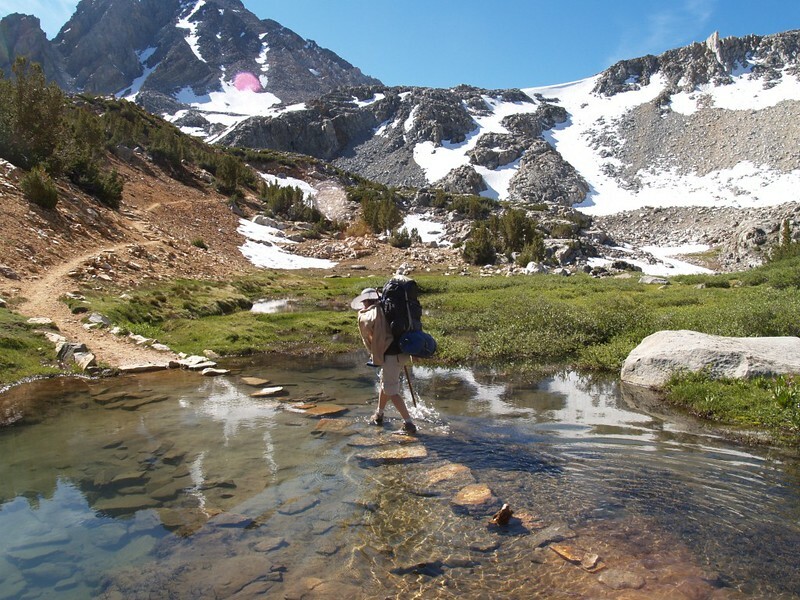 Water was rushing down everywhere from snowmelt on all of the nearby slopes; the sound of water was all-pervasive. But we didn’t hike for very long, and soon enough we were back in camp, reading and relaxing. 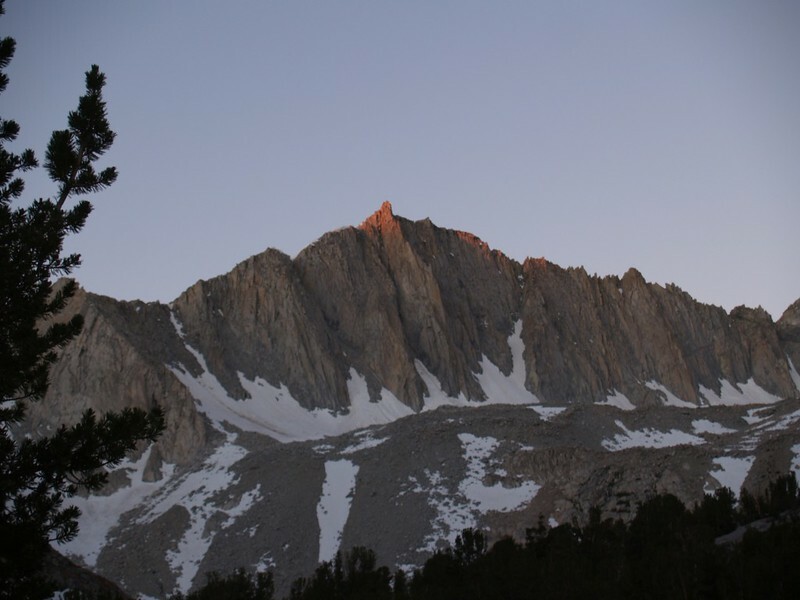 We had dinner and watched the cloudless sunset, and the light playing on Chocolate Peak. 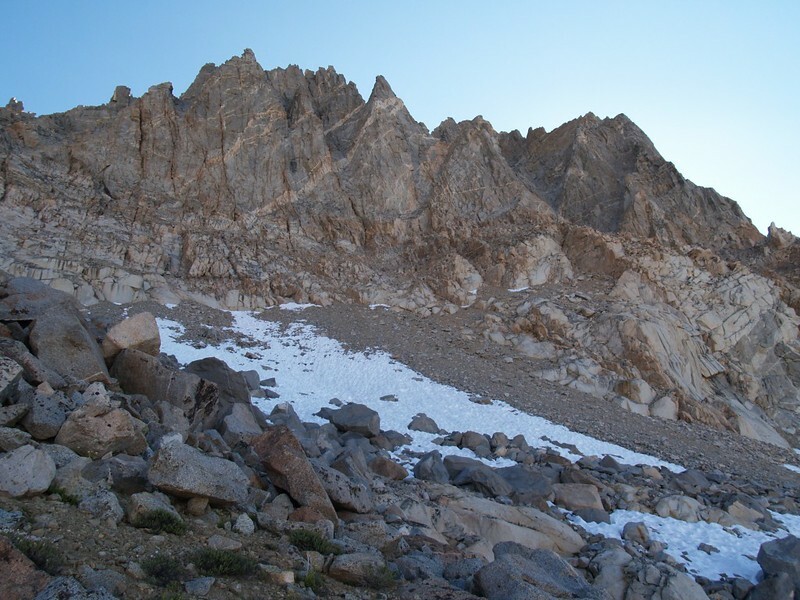 We went to bed early that night, hoping to make up for the long night we’d spent driving, and hoping that we’d have the willpower to wake up early for the main push over Bishop Pass the next day. 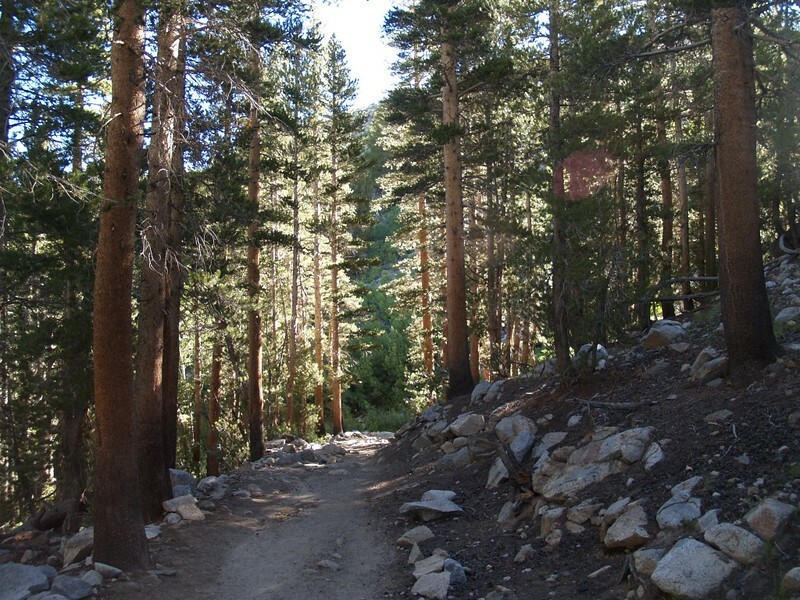 Day 2 Summary: Continued up the trail toward Bishop Pass, elevation 11972 feet. 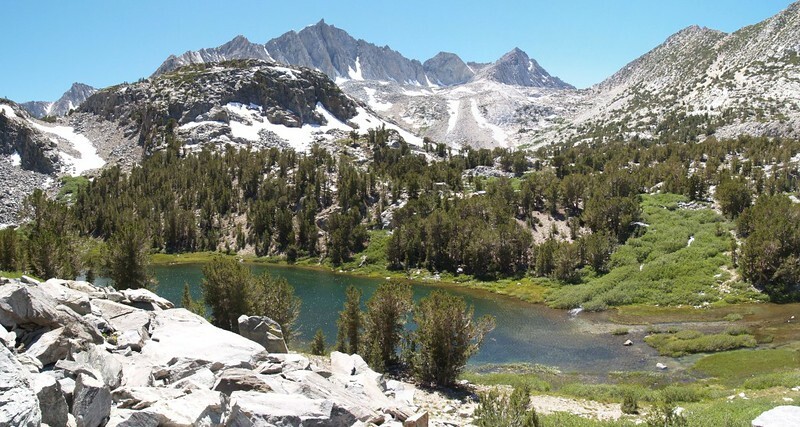 Once across the pass we would be in Kings Canyon National Park. We bypassed the official pass and headed cross-country to the southeast until we found a nice spot high above Dusy Basin at about 12000 feet elevation. We hiked a whopping 4.5 miles. Had a great view, and the breeze kept away the mosquitoes. During calm intervals the mosquitoes found us, but we were ready for them. High wispy cirrus clouds made for great photos and an incredible sunset. A perfect Sierra day. We started the day early, hoping to get a jump on the mosquitoes, and also to get as much of the uphill finished before it got too warm. 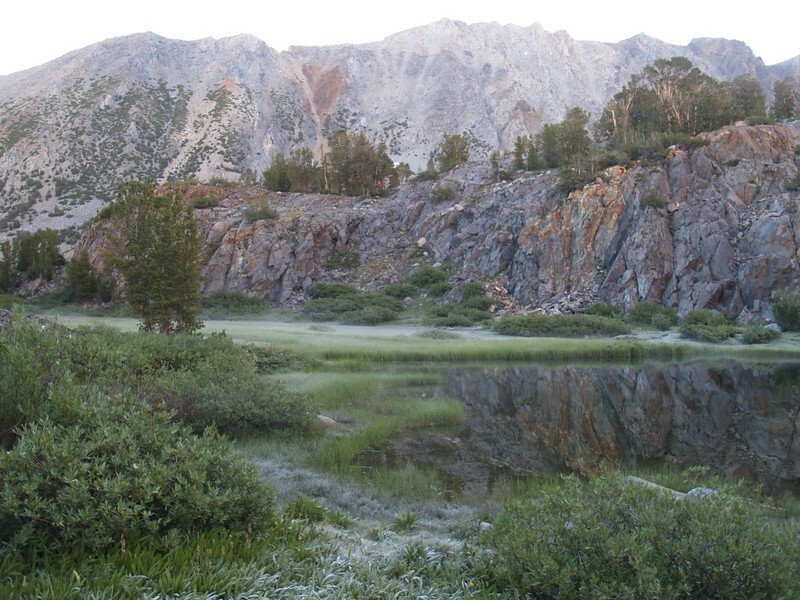 We ate breakfast, packed our gear and started hiking, initially retracing yesterday’s dayhike up along Spearhead Lake. 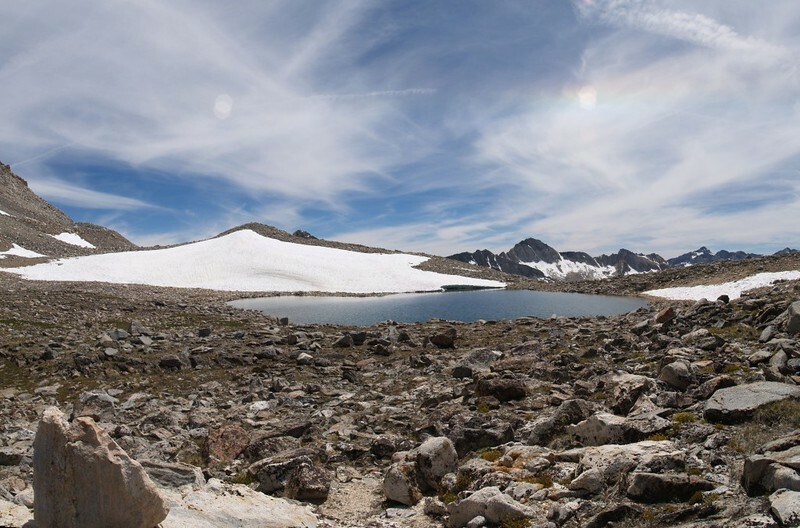 After that the trail climbed solidly, until we rounded a corner and discovered the beautiful Timberline Tarns. The outflow from the as-yet-unseen Saddlerock Lake rushed down the steep slope into the Tarns and we stopped to enjoy the views back down the valley. We hiked up the slope to Saddlerock Lake, which was quite large. 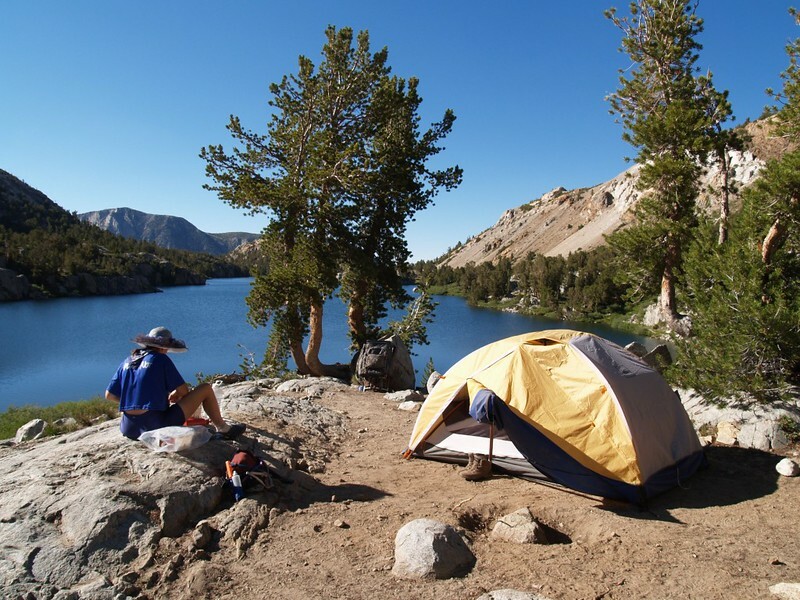 We saw trout swimming along shore, and some fishermen were camped across the way on a nice knoll above the lake. 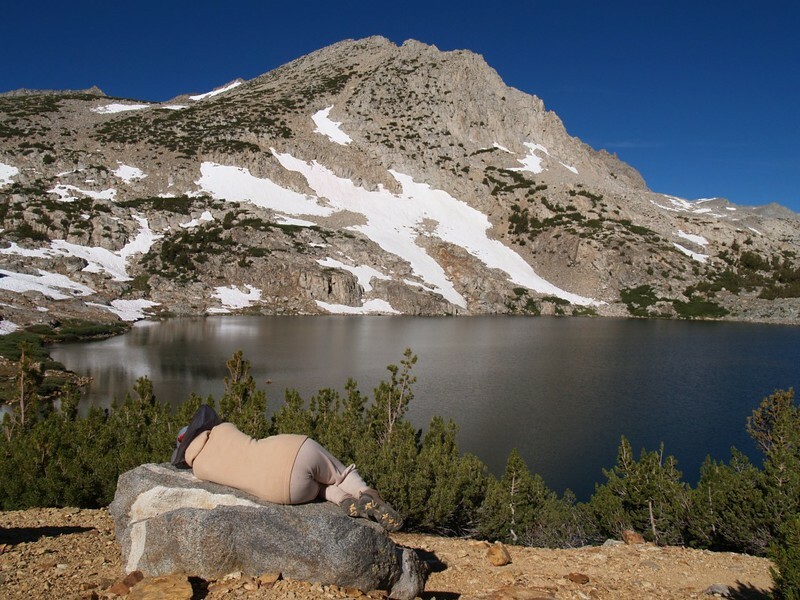 Vicki was a bit tired (still not acclimated), and she took a long nap on a big boulder while I read my book. We met up with a friendly hiker named Casey, and talked awhile. He was heading to Thunderbolt Pass, where he would spend a day or so acclimating before climbing three fourteeners: Thunderbolt, Starlight, and North Palisade. 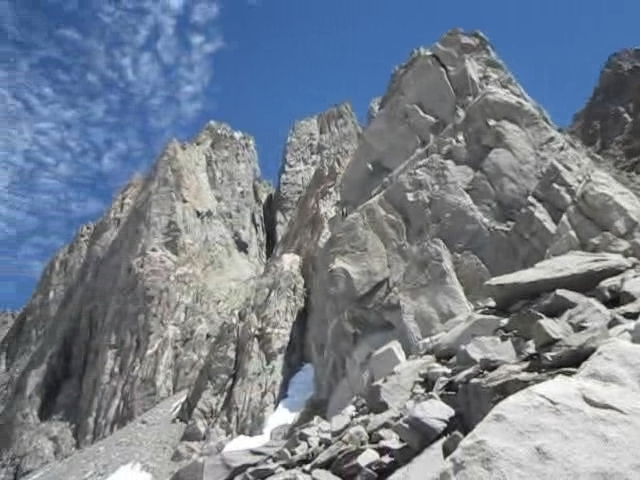 These peaks were only climbable using ropes and other safety gear. 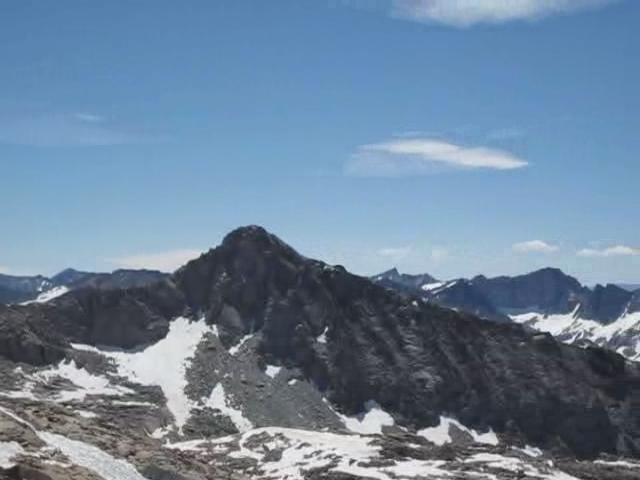 As it turned out, he was a serious peakbagger, and these were the last three fourteeners he needed to summit to complete his list of fourteeners in the lower 48 states! He didn’t say so, but he may have purposely saved these for last, as they are some of the toughest and most beautiful 14ers of all. All too soon (for Vicki) it was time to keep hiking. We continued uphill over easy country, with the views getting better as we climbed above the treeline. There was snow all over the nearby mountains, and all of it was melting in the sun. There were rivulets and tiny streams and waterfalls everywhere. I wasn’t as worried about snow on the pass, as we had spoken to other hikers heading back out. They said that you had to cross some snowy sections, but they weren’t particularly difficult. 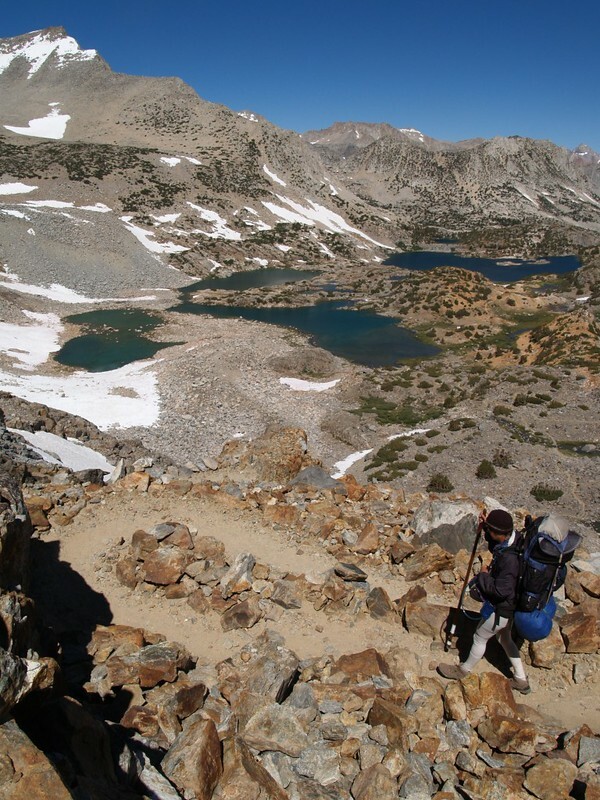 By the time we reached Bishop Lake, the trail was already crossing snowy patches, and we hadn’t even climbed the final switchbacks on the canyon’s headwall that we could see just ahead of us. The final headwall was roughly 500 feet of climbing in about a half mile of trail, which was pretty darned steep, but still surmountable by horses and other pack animals (like backpackers). But the climb, while tough, was well worth it, as the views kept getting better. Meanwhile, some high cirrus clouds began moving in, and the sky became ultra-photogenic. You don’t want to know how many photos I took. It was so pretty along here that I barely noticed the huge load I was carrying. Having made it this far, and this high (12,000 feet! 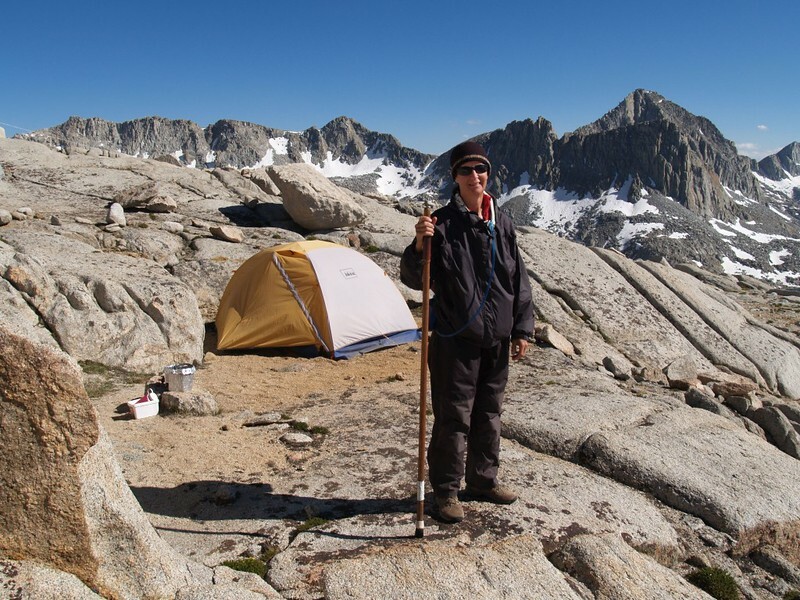 ), Vicki decided that she had absolutely no desire to lose any elevation whatsoever, if that was at all possible, because she’d only have to climb back up to this spot again a few days later when we headed out. This was pushing the limits of her lungs and heart. In fact, she was breathing hard just standing still! So, she took yet another nap up at the top of the pass while I consulted the map and planned our next moves. Our best hope, to avoid going downhill, was to sidehill along the upper basin area. But it might be steeply sloped, and difficult to find a spot for the tent. Also, what would we do about water? Water tended to go downhill, and Vicki wouldn’t want to go to it. I wasn’t thrilled with my choices, but it couldn’t hurt to have a look at upper Dusy Basin, and see it with our own eyes. And, as it turned out, it was perfect: We wandered around a bit and found a flat sandy spot amidst the granite slabs and boulders. And the melting snow above us provided a convenient source of water! It was also a bit breezy up here, and if we were lucky there wouldn’t be many mosquitoes. So we set up the tent and got everything unpacked. This was going to be our base camp for the next three nights, so we might as well spread out and make ourselves comfortable. So, what did we do for the rest of the day? Not much of anything! We spent quite a bit of time just setting up camp, blowing up air matresses, fluffing up sleeping bags, and filtering plenty of water. But that didn’t take very long. 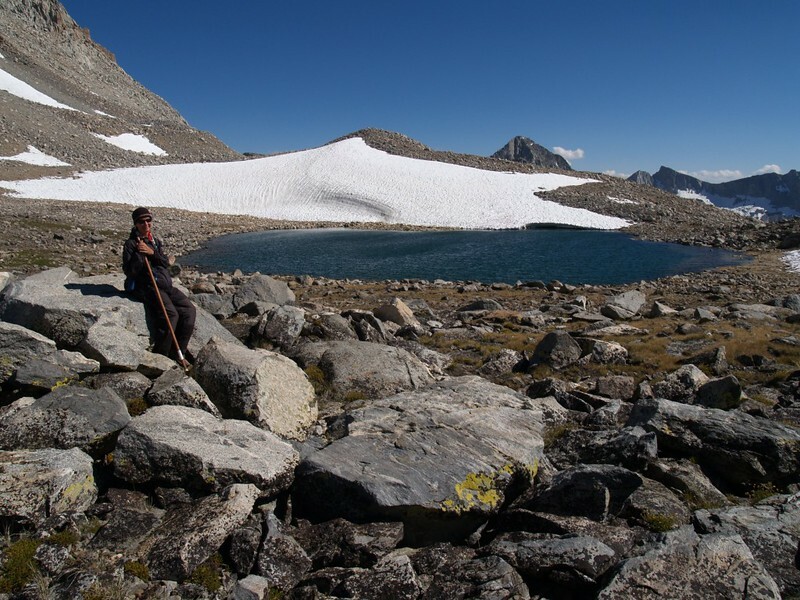 After that we simply wandered around the local area, looking at rocks and tiny alpine plants and flowers, amazed that anything could survive up here, where there were only three or four months per year without snow, and where frost might occur at any time, even in high summer. But mostly we simply drank in the awesome views, and took plenty of photos. 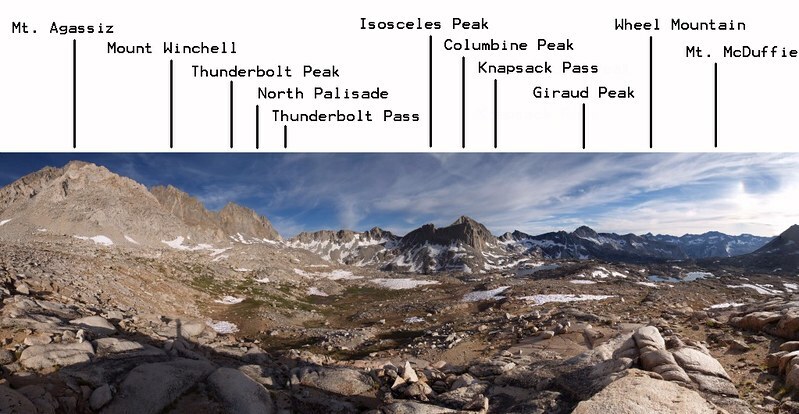 I studied the map after lining it up with magnetic north using my compass, and did my best to determine the names of all of the local peaks and passes. Vicki and I then formulated a plan for where we would dayhike over the next two days, but we really only made plans for tomorrow: We would hike over to Thunderbolt Pass, where we might meet up with our new friend Casey again, and from there we would be able to look down into Palisade Basin, which was supposed to be similar in beauty to Dusy Basin. I liked this idea. And it was only a mile and a half away, at a similar elevation, with not much downhill hiking at all, which Vicki liked. We ate dinner and lounged around some more. As the sun set the air grew colder and I took a few photos of the early sunset, trying to render correctly a bit of alpenglow on the mountains to the east of us. Then I headed for the warmth of the tent, to get out of the chilling breeze. The sunset was turning out to be a dud, even though I had originally expected more of the high cirrus clouds. Oh well. But Vicki didn’t want to come in. She had faith in the clouds. And her faith turned out to be justified! Soon enough, I heard “John! Come out and bring your camera!” But I didn’t want to. I was warm and comfortable. So I grudgingly poked my head out through the partially unzippered doorway to see what all the fuss was about. “Wow!” I said to myself. “Why hadn’t she called me sooner! Now where’s that camera?” And so I pulled on my shoes and went gladly out into the cold. And it was excellent. The sky was lit with color in every direction. And right when we thought it couldn’t get any better, it did. We stood together, arms around each other, just staring off into the distance for a long, long time. 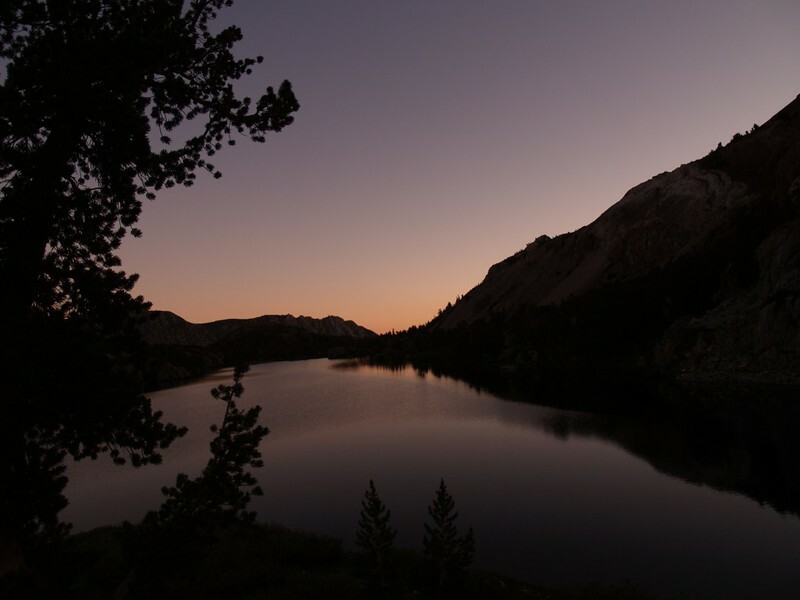 Eventually, of course, the colors faded, and darkness descended upon the High Sierra. By this point we were shivering a bit, so we reluctantly turned and headed for the tent. We decided that getting a tiny bit hypothermic was a fine trade for a glorious sunset, and we also knew that cuddling each other in the sleeping bag would cure it. And that’s exactly what we did. Day 3 Summary: We had decided that this would be our base camp and that we’d strictly do day-hikes from here, because we didn’t want to carry our big packs all the way down into the mosquito-ridden lower basin only to carry them back uphill two days later. 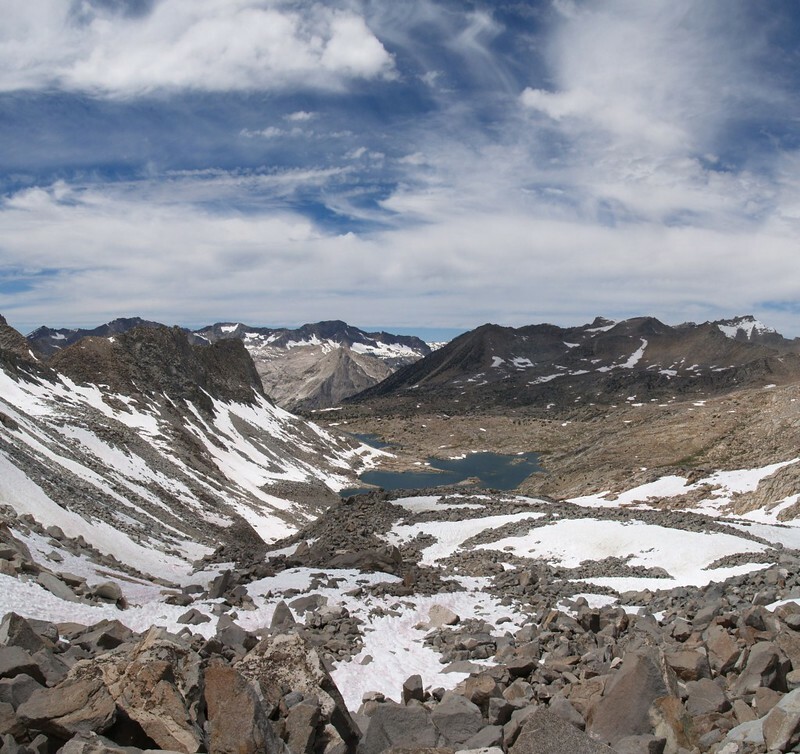 So today we hiked 1.7 miles to Thunderbolt Pass, elevation 12,400 feet, overlooking the Palisade Basin, where we could see almost forever south into Kings Canyon National Park. We ate lunch and hiked back via an easier route. Still, it took three hours each way thanks to the huge boulders and talus and icy snow on this strenuous cross-country route. We woke up early out of habit and viewed the sunrise. It was cold here in the shadow of the Sierra, but it wasn’t quite freezing. We had some hot chocolate and breakfast, which helped to warm things up. Then we retired to the tent to get ready for our dayhike. It seemed like the essence of lazy luxury to leave the tent standing (and sleeping bag unpacked) for the entire day. I decided that I could get used to this. Based on the map, we had to climb about 400 feet to reach Thunderbolt Pass. 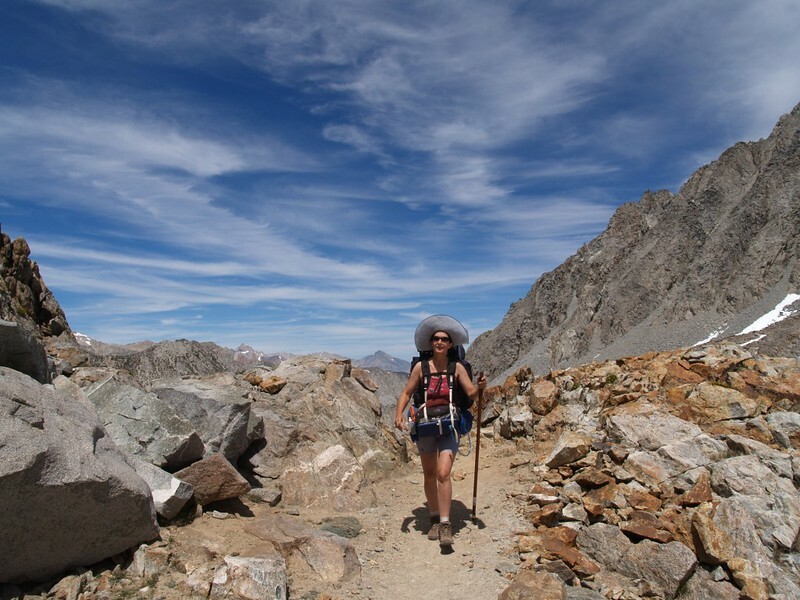 Therefore, Vicki planned to stay as high as possible on our way there, making a traverse just below the truly steep slopes leading up toward the precipitous peaks. 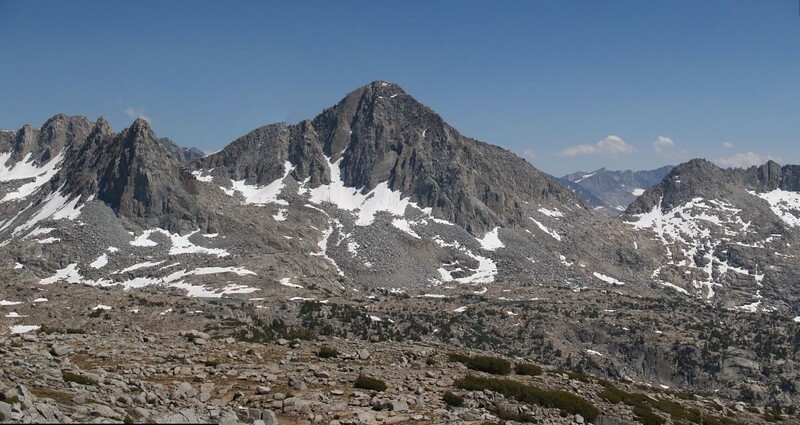 We were camped just below Mount Agassiz, and would pass along the side of Mount Winchell before reaching Thunderbolt Peak. From where we stood, it looked to be an easy hike, with maybe a bit of rubble to hike through. And that was our big mistake, for appearances can be deceiving! 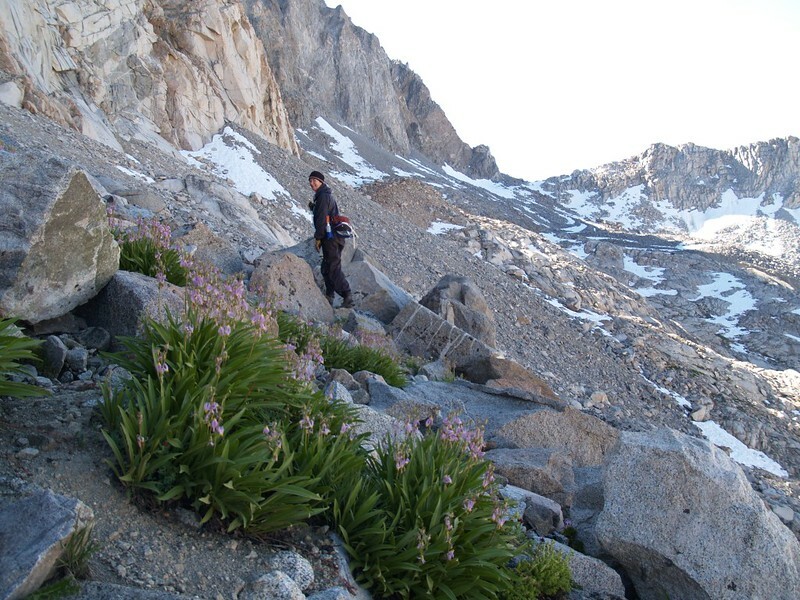 We hiked along, staying as high as possible on the scree-field just below the towering granite of Mount Winchell. And it was very slow-going. 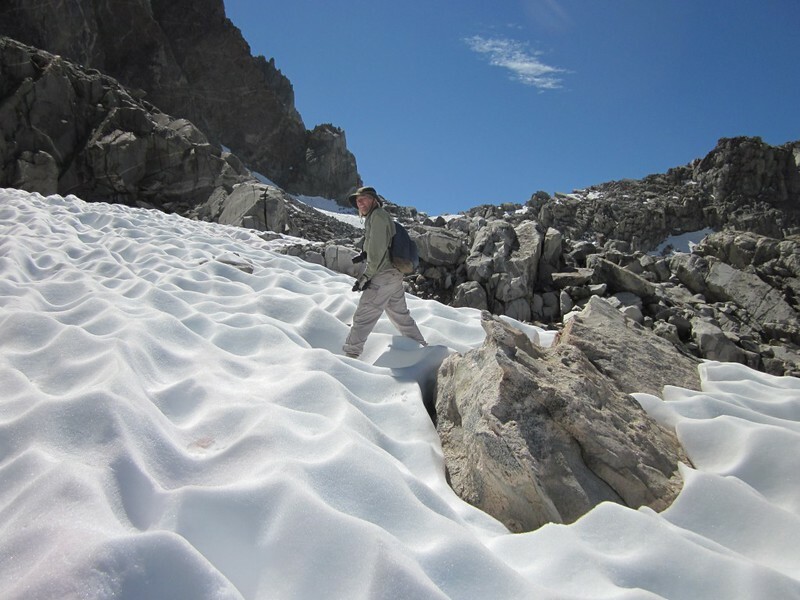 Lots of unstable boulders, and, as we climbed higher, patches of snow still lingered below the mountain’s chutes, and we had little choice but to cross them. The problem was, the snow had re-frozen during the night, and remained in shadow for most of the morning. It was bumpy and sun-cupped from the afternoon melting period, which made for some stable foot placements, but at the same time it was rock-hard and icy, making it easy for one’s feet to slide out from under without warning. Slow movements and treacherous footing, whether on rock or ice. 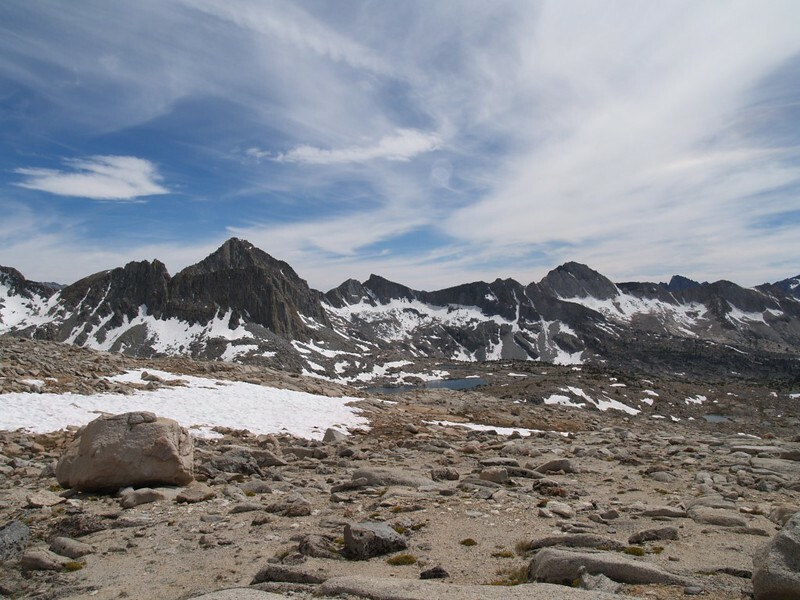 From the outset, we had seen a long rib of granite that ran directly across our path. Vicki, true to form, decided that going below it was a loss of elevation not to be tolerated. For after all, we had to climb 400 feet anyway, so why not now? Losing 400 followed by climbing 800 was unacceptable. So we suffered. And hiked very slowly. But eventually it got so difficult that even Vicki conceded defeat, and we dropped back down to a snow-free zone. But not until after we’d passed above the granite rib. As we hiked along next to Mount Winchell, we met up with a couple who were preparing to climb the peak. They had ropes and other rock climbing gear, as one would expect. 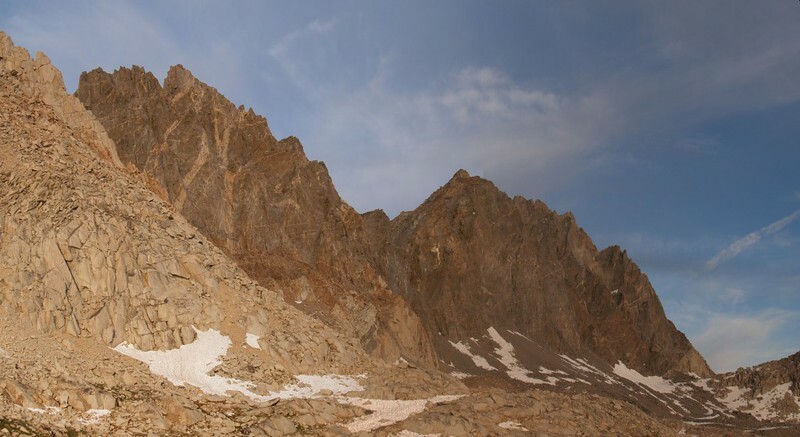 We discovered that the man was the guide that Casey had hired to take him on the Thunderbolt-North Palisade Traverse. He was just here a bit early, and wanted to get in a bit of fun on Mount Winchell! We were impressed. But he was also relieved to know that his client was actually here at Thunderbolt Pass. After that, we continued onward, bearing equally good news for Casey. 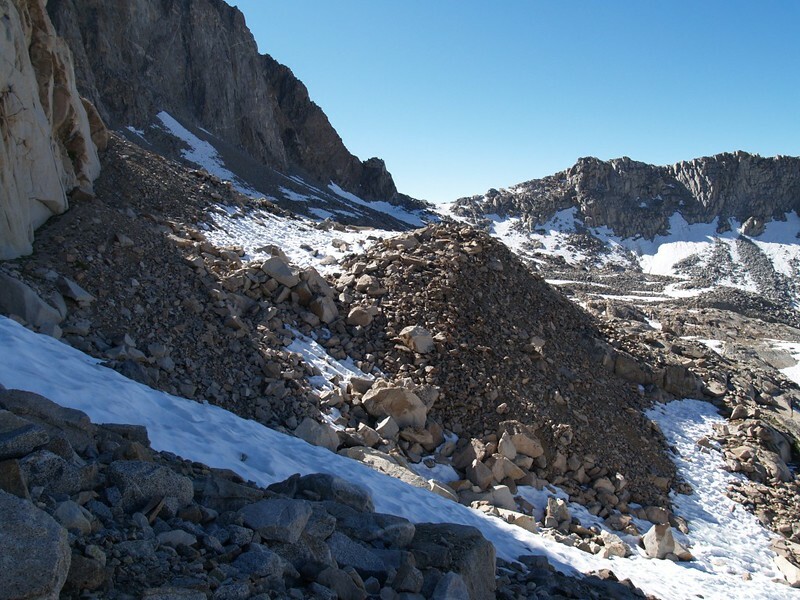 As we approached the pass, loose scree gave way to large blocky talus, and we slowly rock-hopped our way uphill. I decided that it didn’t matter if we were slow and needed more rests, as I was more than happy to turn around and take photos of the snow and lake-filled basin below us. Just the same, by persevering, we attained the pass in the end. As expected, we met up with Casey and he gave us a tour of his humble, yet airy, home. 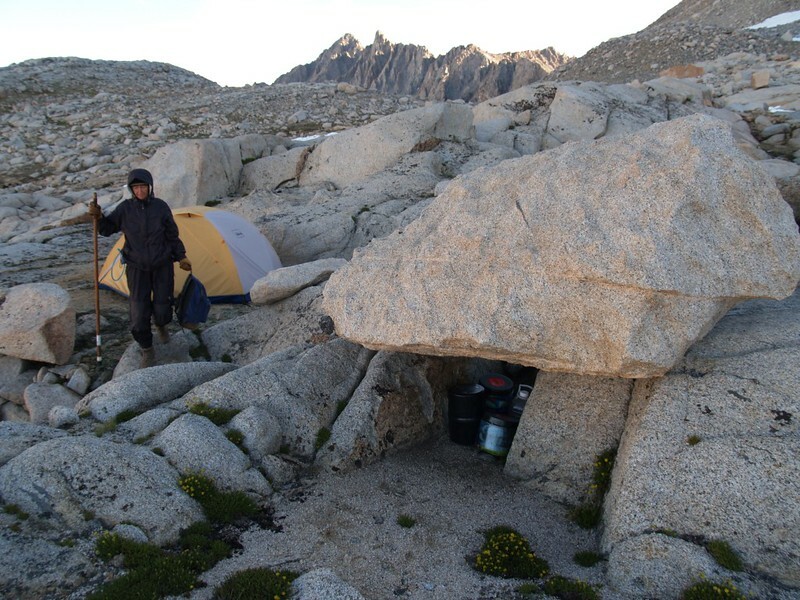 He was camped just below the pass on the Palisade Basin side. He, too, was quite happy that this was such a big snow year, as he would have had to hike all the way down into the basin to get water. There was water everywhere up here, provided that you collected it in the heat of the afternoon, and kept it from freezing at night. We ate lunch and shared some snacks. We swapped hiking stories. We wondered about the upcoming weather, and Casey was worried about all the clouds. I tried my best to reassure him that cirrus clouds were perfectly safe. 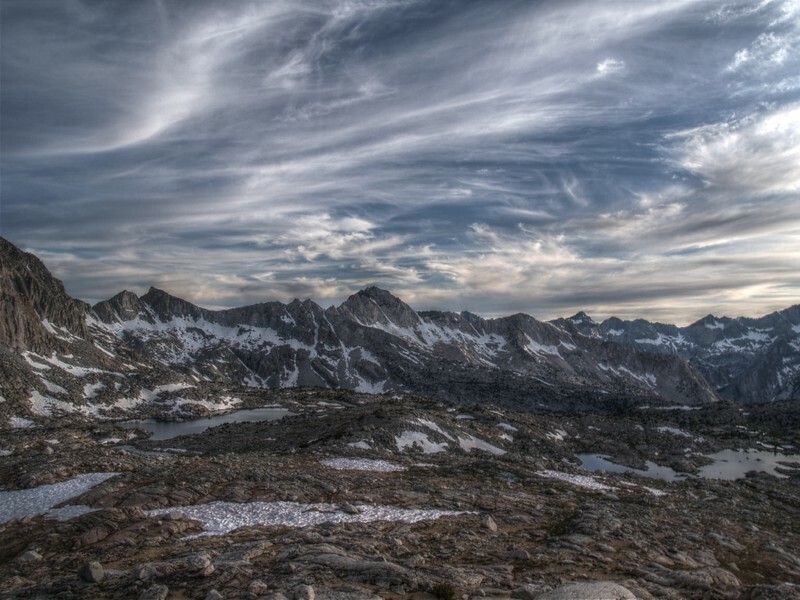 It was the puffy cumulus clouds that he had to watch out for, as they tended to start small and harmless in the morning, but soon they grew larger, hovering above the peaks themselves, fed by the warm updrafts rising in the sun. In the summer, the cumulus clouds often grew into monstrous thunderheads by late afternoon. 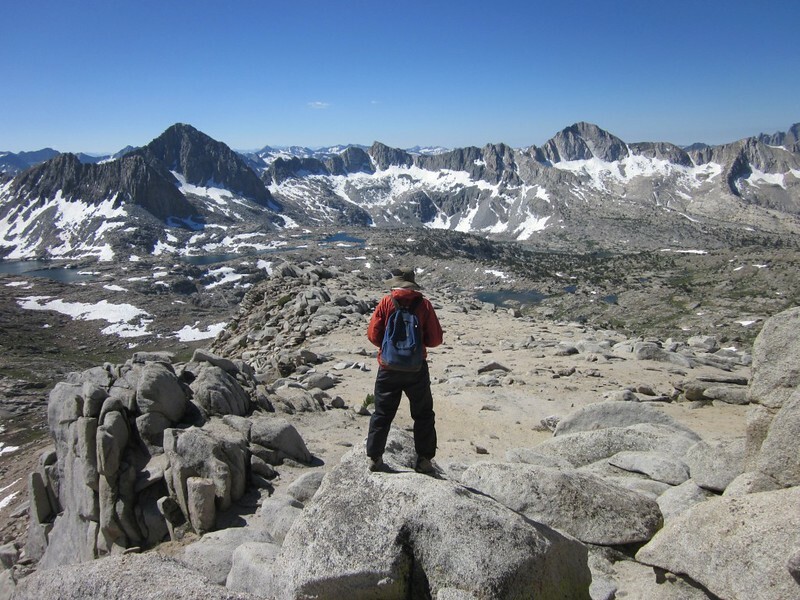 As he intended to climb Thunderbolt Peak the next day, he had reason to worry. In fact, the peak had been named when its first ascensionists had nearly gotten hit by lightning! He didn’t want a repeat of that scene. Lunchtime passed, and we began to get cold sitting around up there in the breeze. I shook Casey’s hand and wished him luck on his big climb the next day. We left him there, hopefully worrying less about the clouds and more on completing it safely. Maybe we’d see him in two days, as we’d both be hiking out by then. And then we began the trek back to camp. But this time, learning from our morning’s experience, and seeing the route from this new, much higher, perspective, we decided to head down low and walk along some grassy lanes and smoother slabs of granite. We didn’t want any more of that loose scree, where every step attempts to slide out from under you, or on ice, which is even worse. We decided to stick to the medium-large talus, the kind that you could you could rock-hop and have fun on. 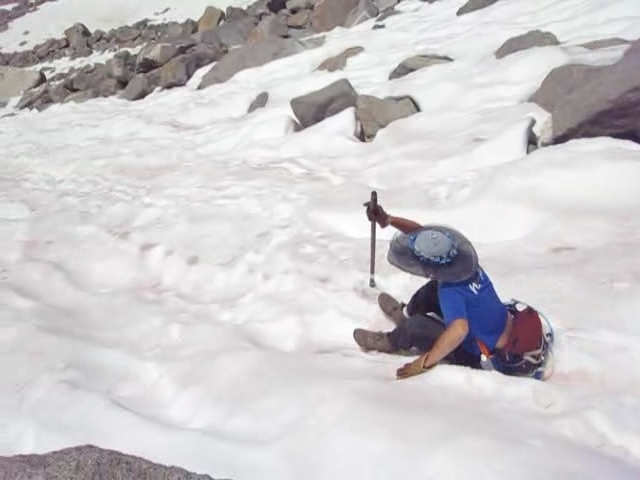 And if we wanted to slide down some steep soft snow, well, even better! 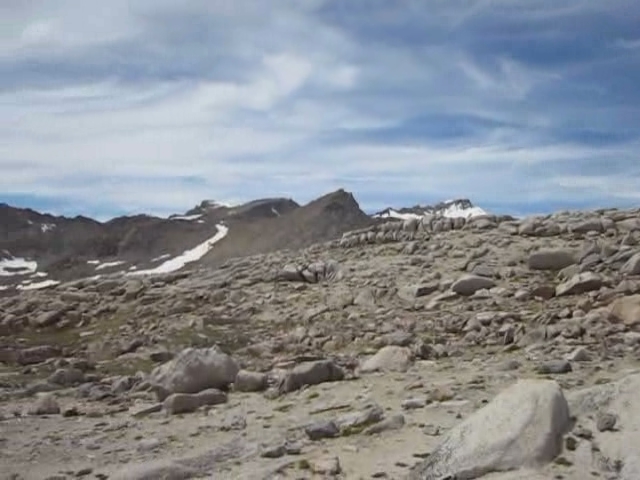 Thunderbolt Pass glissade video – The bumpy suncups made this into a very slow glissade. When we got back to camp it was late afternoon. Vicki took a nap in the tent while I filtered some more water, enough to last us until tomorrow’s dinner. We took out the map and studied it. I asked Vicki what she wanted to do. 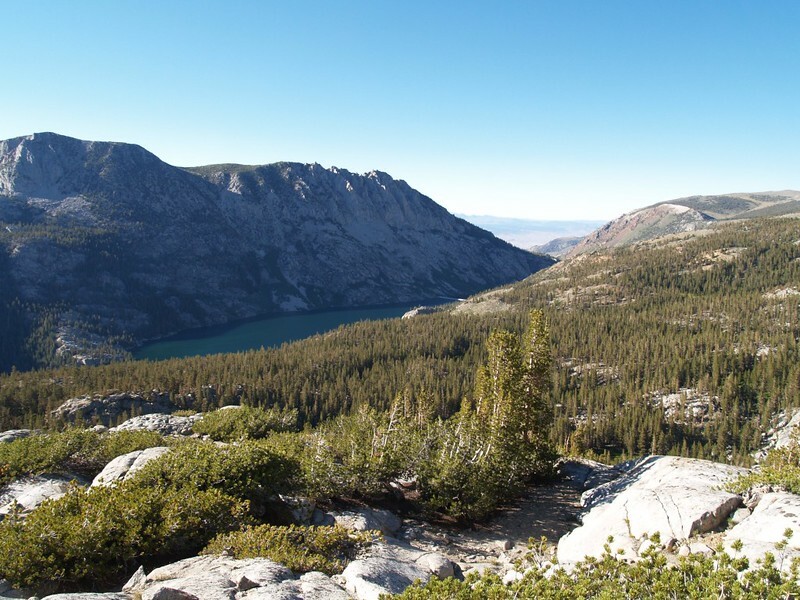 Should we hike down to the lakes out there in the basin below us? Or what? It didn’t really matter much to me. I was simply happy to be out here. Much better than being at work. Anything she chose would be fine. But Vicki still didn’t want to go downhill; she was adamant. So we looked at the map. We’d just spent the day heading southeast, so what about northwest? And that’s when we decided to dayhike over to the other side of the basin, staying high and maybe climbing a bit higher, for the views. An excellent, if vague, plan. After that we ate dinner, tended to the usual campsite chores, and watched the sunset. Sadly, almost all of the cirrus clouds had blown away to glorify someone else’s sunset, and all we got was a bit of color in the west. I didn’t take quite so many photos, but it was still beautiful. And then we went to bed. 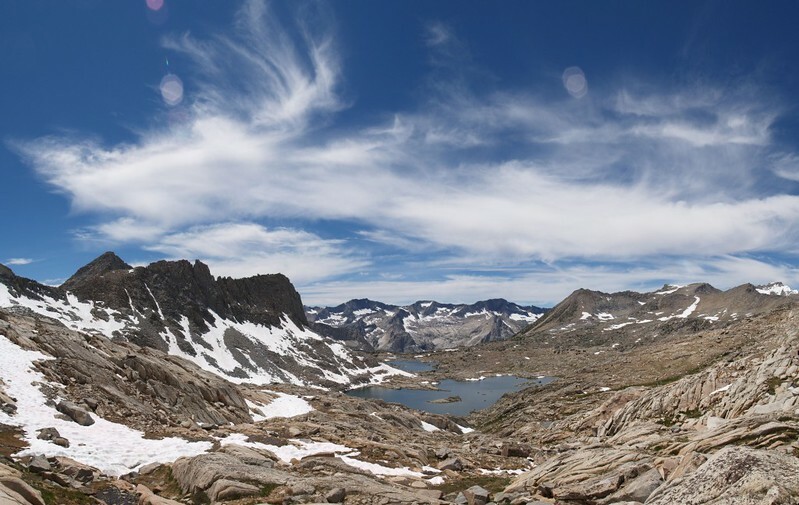 Day 4 Summary: Once again we decided to stay up high (as the views are so much better up there) by hiking along the ridge of the Sierra Crest from Bishop Pass toward Mt. Goode. The panoramic views both north and south from the ridge were fantastic. We climbed un-named peak 12286 and ate lunch on the ridge. 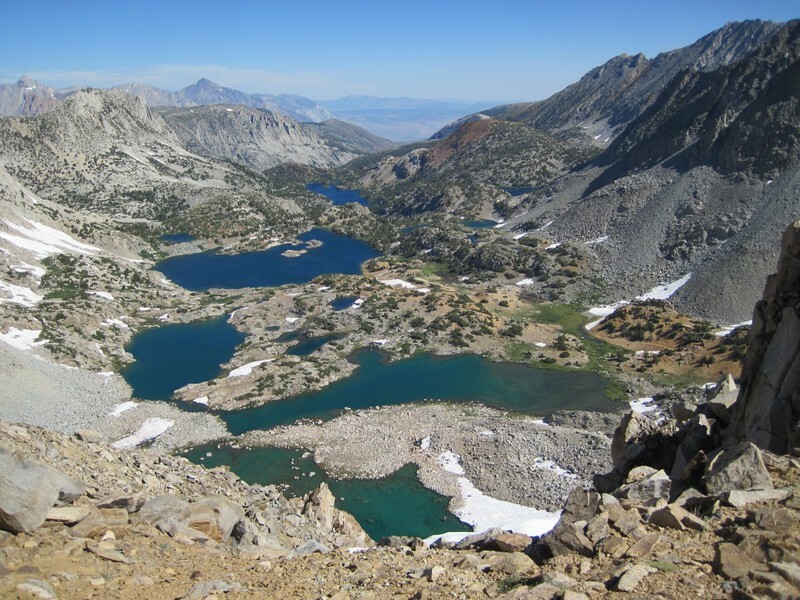 We dropped down from the ridge and hiked along the northern edge of Dusy Basin, hoping for a view down into Le Conte Canyon, but we didn’t get one. It was a cool breezy day with no mosquitoes. We woke up later than usual and lounged around the camp, drinking hot chocolate and eating breakfast, sitting together on a nice boulder overlooking the basin. 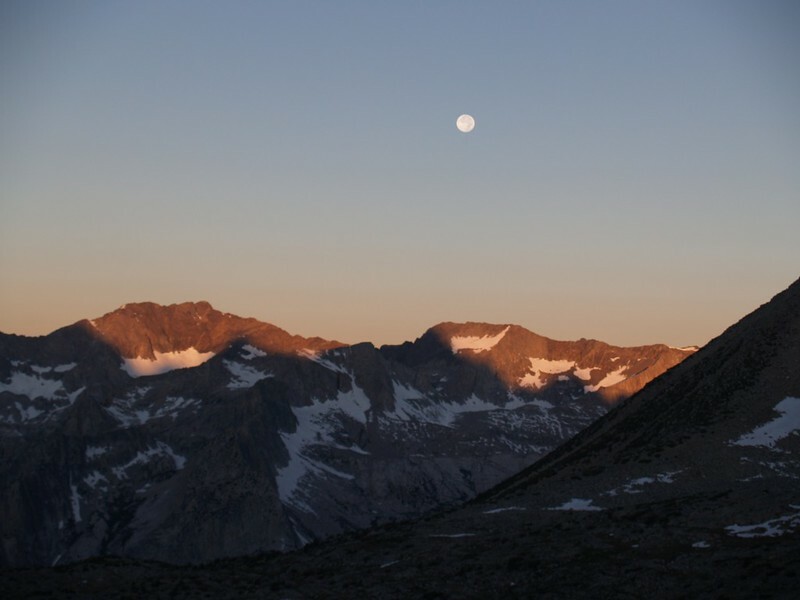 We watched the moon setting over the distant mountains of the Black Divide in Kings Canyon National Park. We really wanted to wait until the sun hit the tent before hiking, but we were situated too close to the mountains. So we got ourselves dressed and ready, staying inside the tent out of the cold breeze. 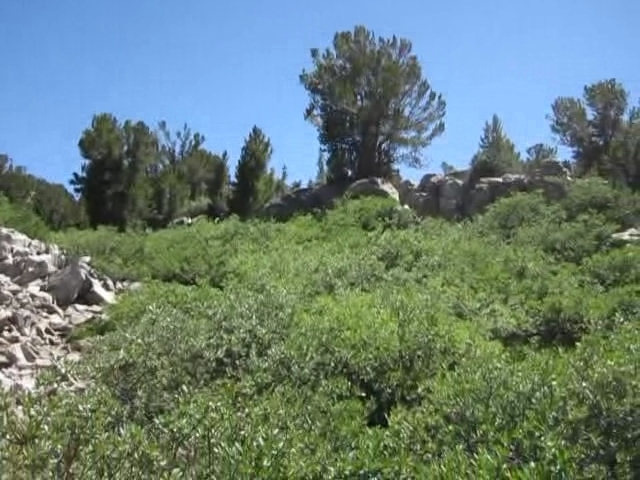 We started our hike by heading for Bishop Pass. 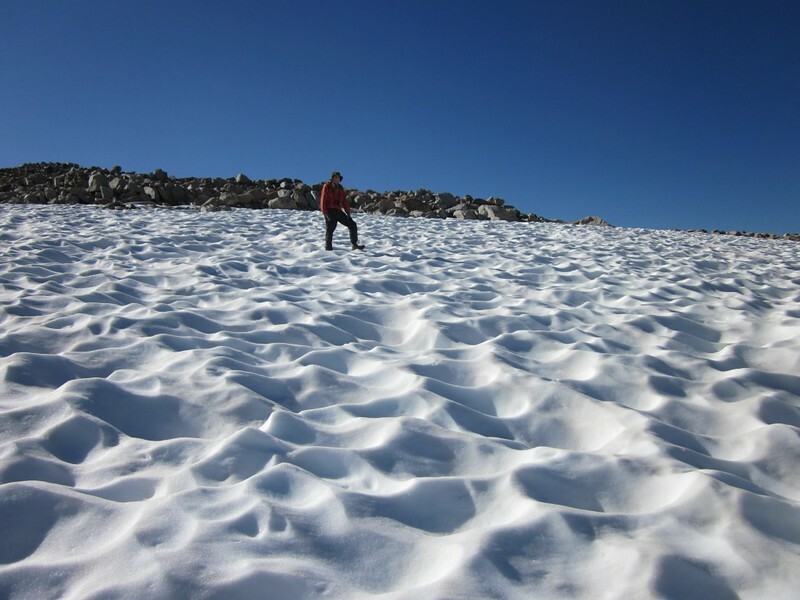 We had some fun crossing some large snowfields on the way. We also wanted to see the official sign. It said we were at 11,972 feet elevation. Let’s just call it 12,000 feet and be done with it. It doesn’t really matter, because we had no intention of going down from there, as our next goal was climbing Peak 12286. 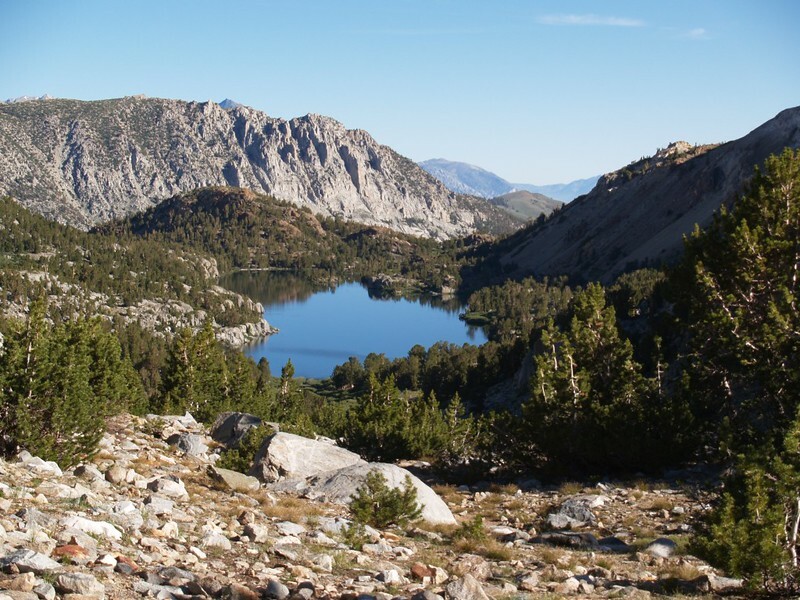 Along the way, we would see about climbing up on the Sierra Crest itself, and gaze back north along the Bishop Pass Trail, and view the many lakes from a unique vantage point. As expected, the views from the crest were fantastic. I took about a million photos, many of which were multiple shots from the same spot, knowing that I would stitch them together later on, on my computer, after we returned home. In fact, I took so many of them that it took me longer to process them than it did to hike along the crest that day! We also took a break for lunch, up on top of the sharp, rocky ridge. 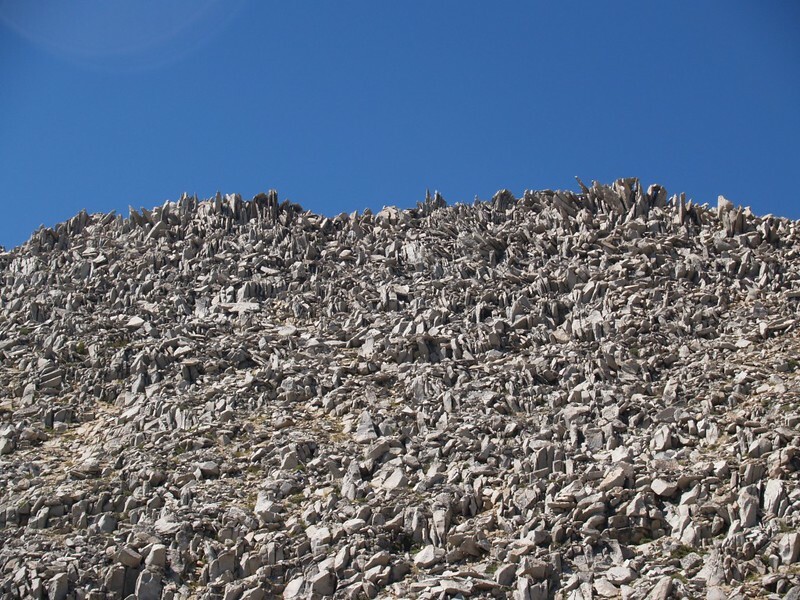 The ridge consisted of many large boulders all jumbled together, so that we had to scramble along it using our hands. It was quite breezy up there, the air fresh and crisp and cool. 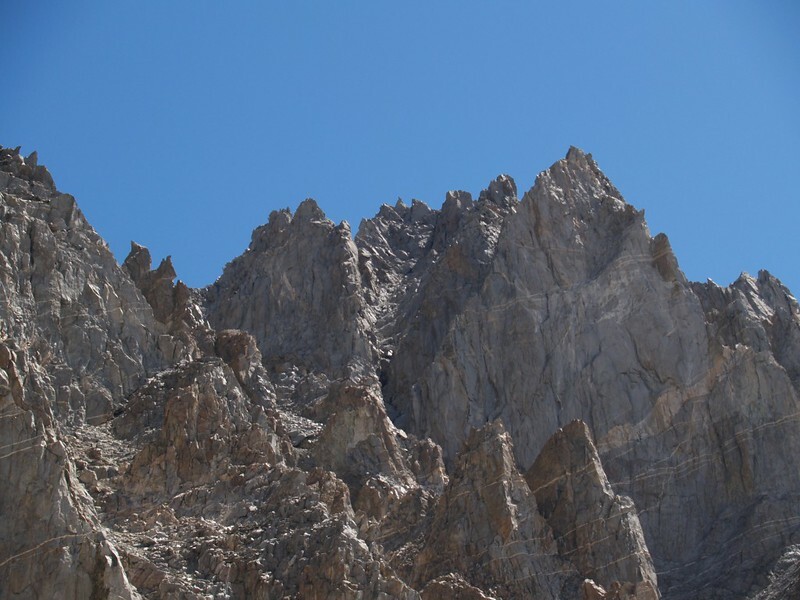 As we ate, we looked over toward Thunderbolt Peak, wondering how Casey was doing. 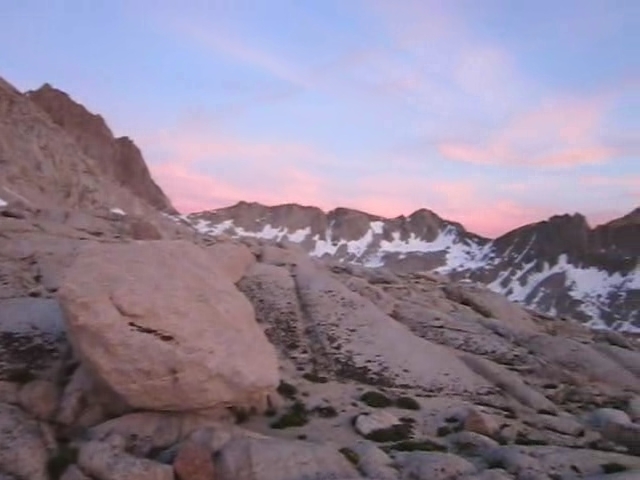 Maybe, if we’d carried some serious optics, we’d be able to see him climbing the “Milk Bottle” summit block of Starlight Peak. But enough daydreaming: Serious optics were seriously heavy! So we shifted our gaze to all of the other peaks that were visible from here, and there were plenty. 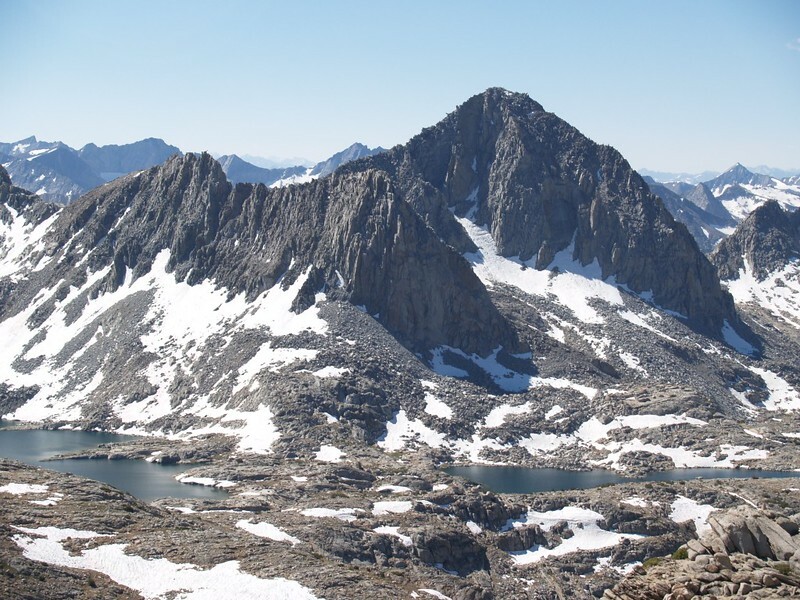 For a rough idea, check out this link on HeyWhatsThat.com which shows most of the named peaks that are viewable from our lunch spot. You might also check it out via the page at peakfinder.org. After lunch, we decided to head directly downslope, to a long plateau-like area that extended west toward LeConte Canyon, but that didn’t descend all that much. 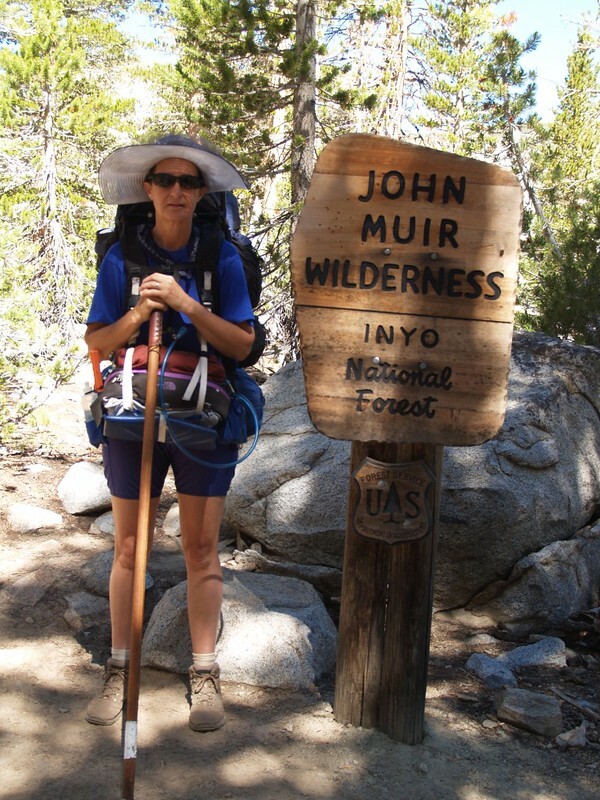 We really wanted to see down into the bottom of the canyon, where the PCT (Pacific Crest Trail) and John Muir Trail followed along the Middle Fork of the Kings River. 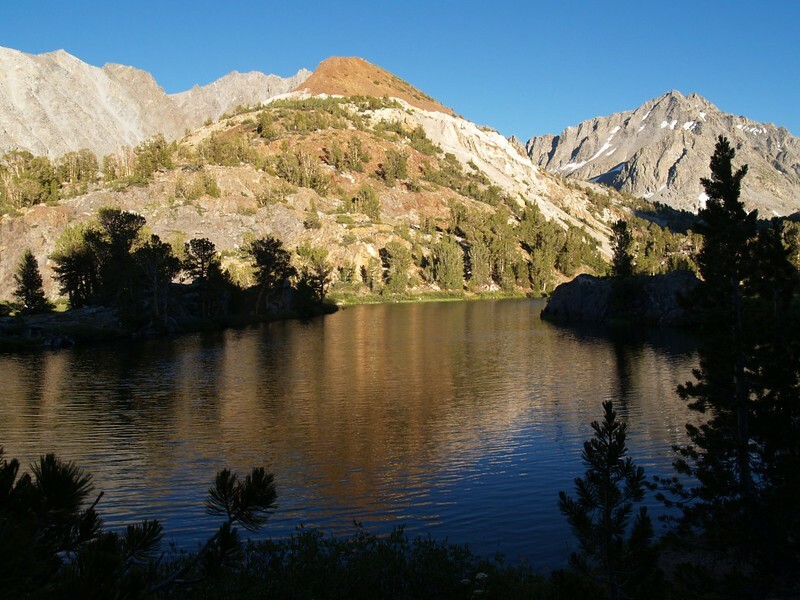 It was pleasant hiking, easy cross-country, and the views of Dusy Basin remained excellent. Unfortunately, however, it turned out that we were unable to see down into the canyon, at least not without doing some serious rock climbing. Or descending deeper into the basin. Neither of which we felt like doing. So we turned around and headed back to Bishop Pass and our tent. Along the way back, which was slightly uphill, Vicki suddenly realized that she was breathing perfectly well, and that her heart wasn’t thumping very hard. And then a sudden realization burst out of her: “I’m acclimated! I’m acclimated! I can’t believe I’m acclimated!” She was so happy. It was really quite endearing. 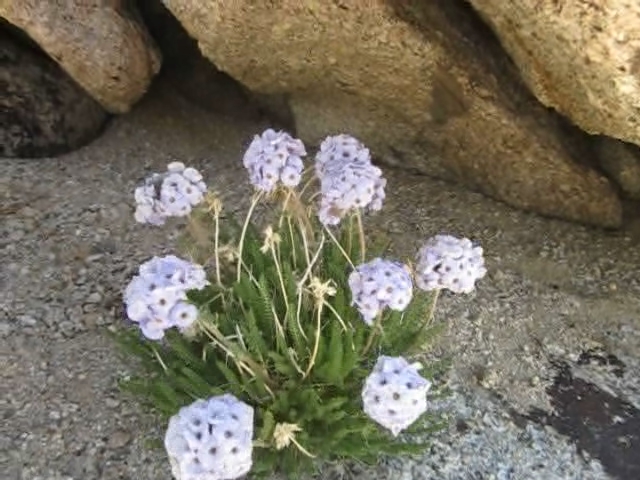 She’d been struggling with the altitude for so long, and finally all her hard work had paid off. I immediately gave her a high-five to congratulate her. “Quick! Let’s climb that mountain over there!” I said, and laughed. She laughed, too, and might have actually tried it if it hadn’t been so late in the afternoon. Upper Dusy Basin and a fully acclimated Vicki! After that, we headed back to camp, and talked about our plans for the next few days. 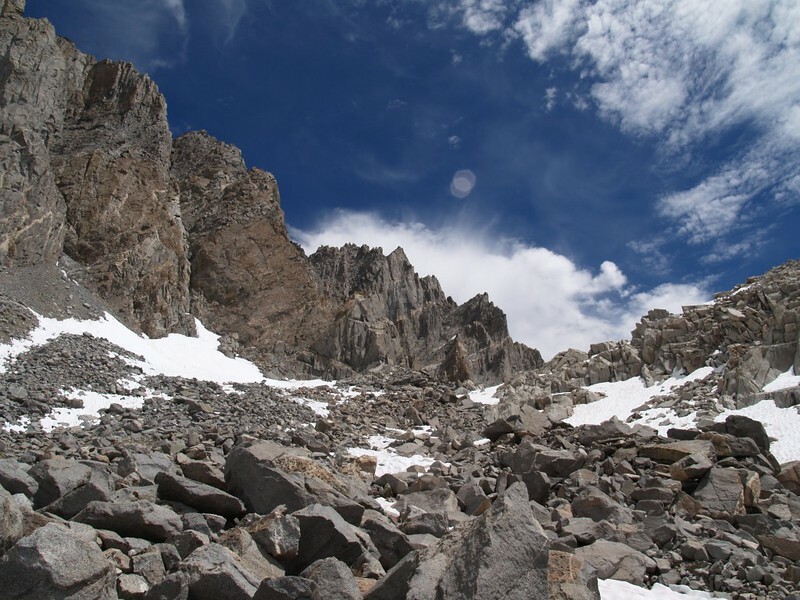 I had been hoping to climb White Mountain Peak (a fourteener, and the third tallest mountain in California), but only if Vicki was feeling up to it. And she was! 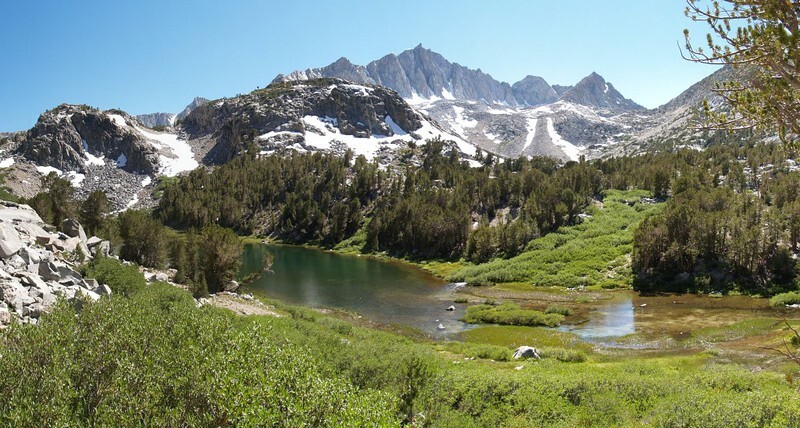 Therefore, our hiking plans mostly centered around the idea of getting down to Bishop and back up into the White Mountain Wilderness as quickly as possible, to avoid losing any of her hard-won acclimatization. In other words, this would be our last night in Dusy Basin. We’d be hiking out in the morning, but we’d take two days to do it, because if we did it in one, we’d get to the car too late in the day to do all the other things we had planned. We weren’t all that sad. 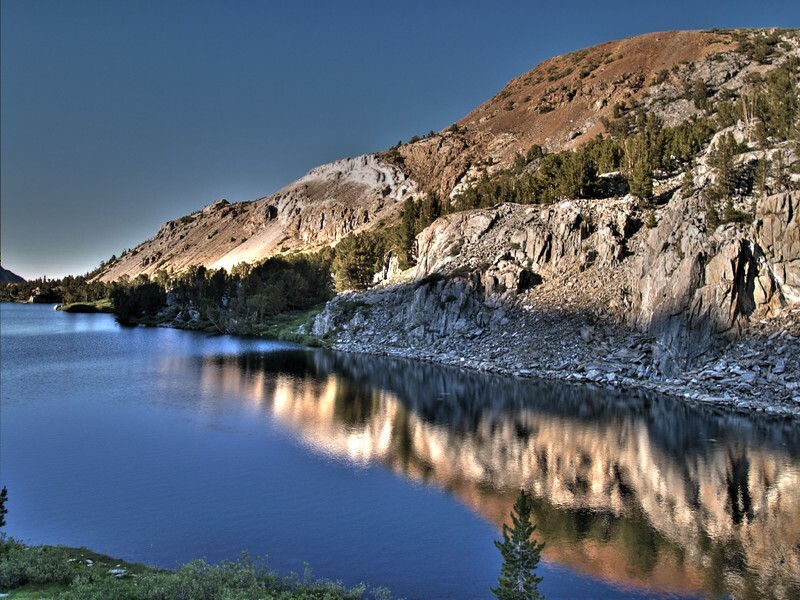 Spend an additional night at Long Lake? No problem! 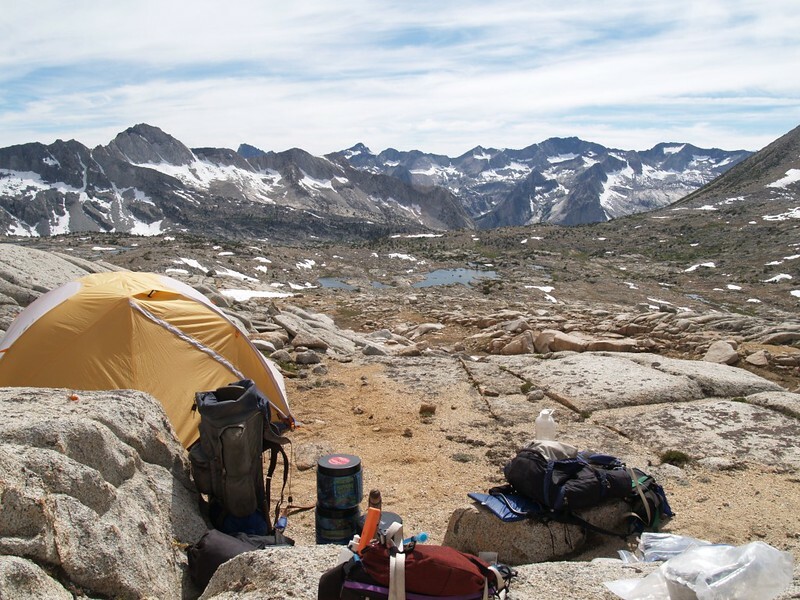 Day 5 Summary: We packed up our base camp and headed back out over Bishop Pass. It was cold and there was ice on the tent. 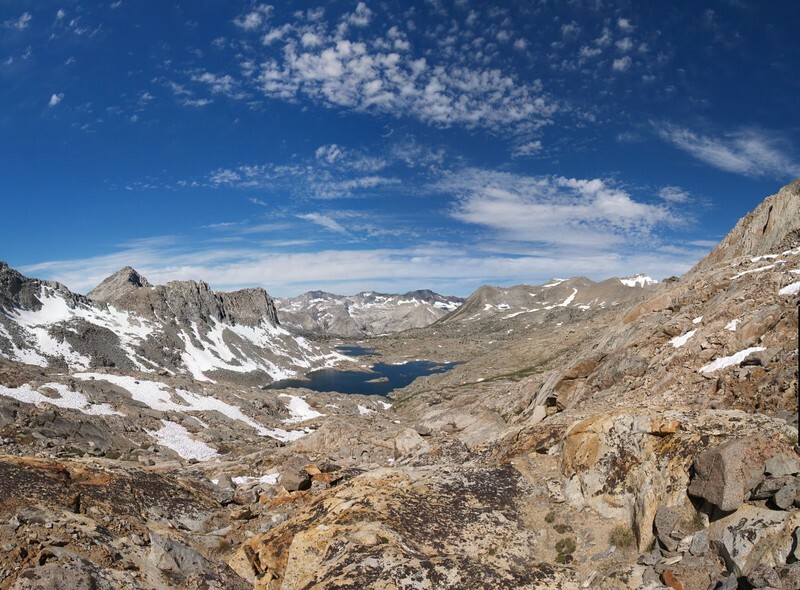 We hiked up and over Bishop Pass for the last time. We checked out the Snow Survey Shelter on Bishop Lake whose entry door was actually in the attic. 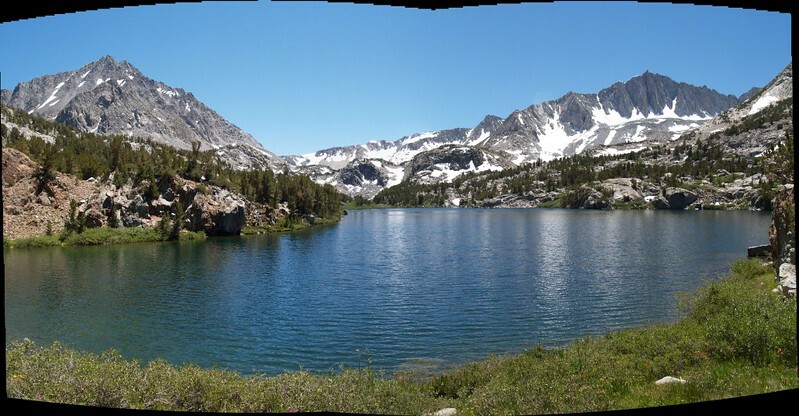 We hiked a total of 5.2 miles and camped at the lower end of Long Lake, once again with excellent views. The mosquitoes, however, were horrible, as the frost of the night before didn’t harm them and the breeze vanished at dusk. We ate dinner early and dived into the tent for protection. It had been a clear night and the temperature had plummeted. There was frost on both the inside and the outside of our tent. Once again, we tried to stay in the sleeping bag as long as possible, but there was no sun to be found in the morning, up there in the shadow of the mountain. But eventually we had no choice. Vicki put on gloves and a hat and made some breakfast while I put away the sleeping gear. Then we sat out on our favorite boulder and watched the sun rising over the basin, holding our cups of hot chocolate in our hands, glad of the warmth, our breath steaming in the cold crisp air. 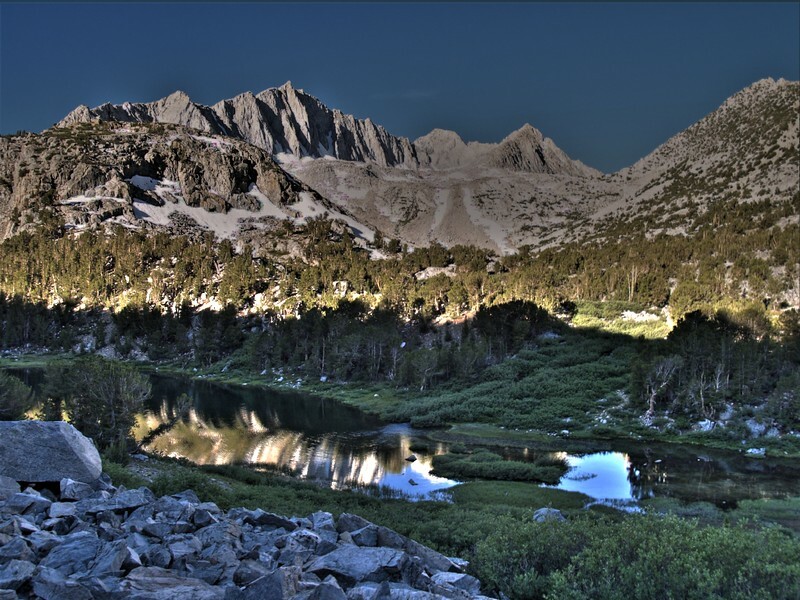 It was looking to be another beautiful day in the High Sierra. 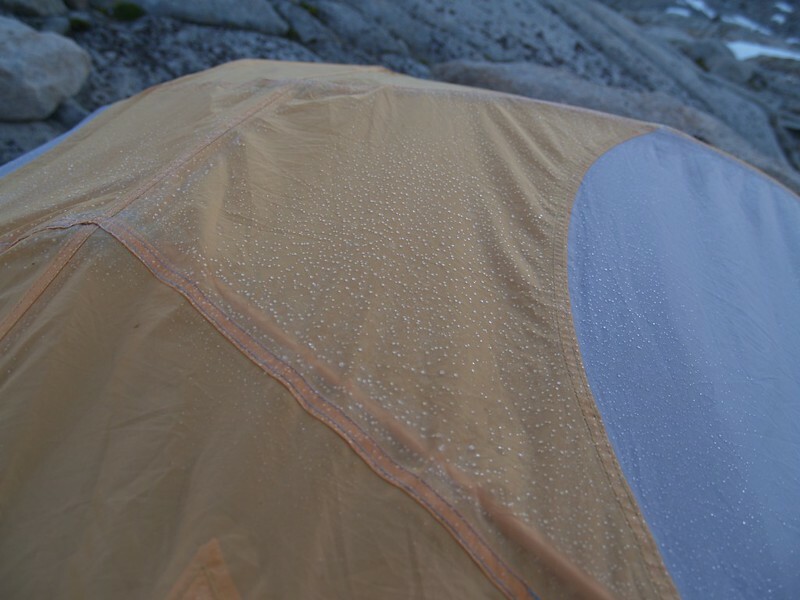 Icy tent in the morning – Brrr! 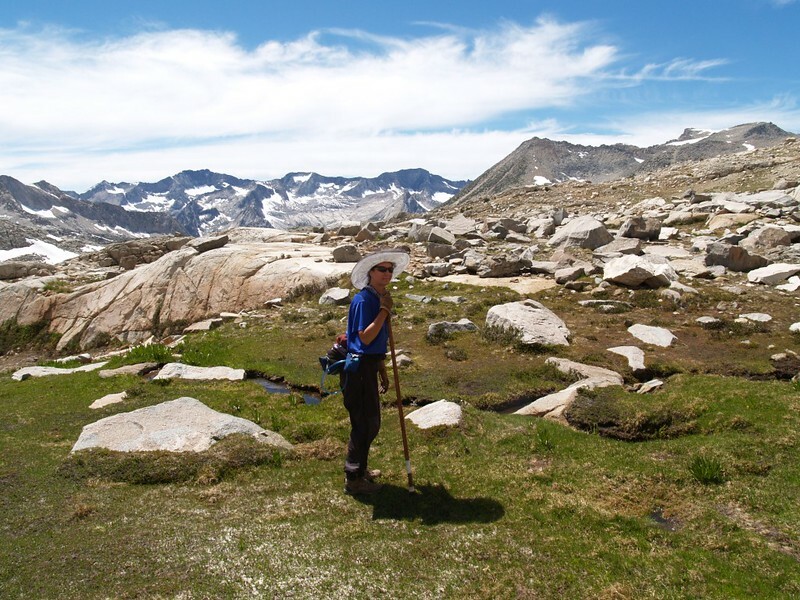 We packed up everything and headed out, hiking cross-country toward Bishop Pass. 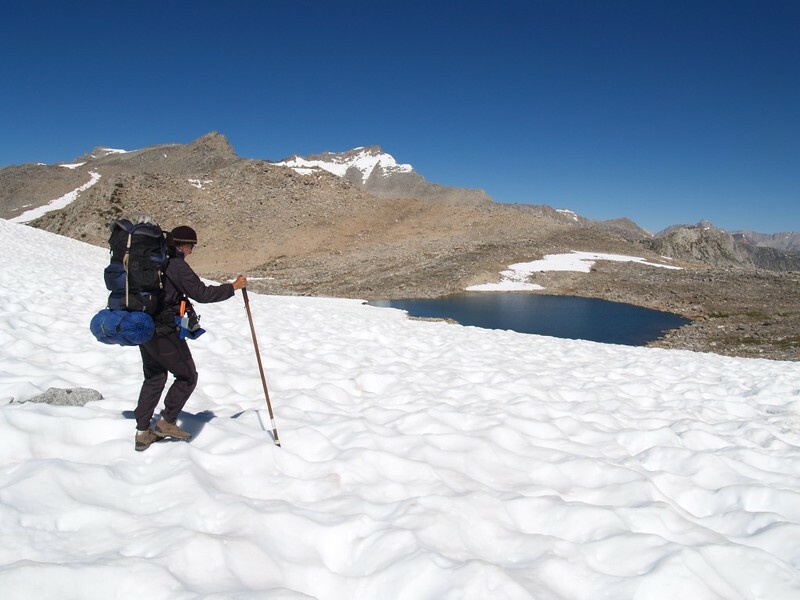 We wandered over snow and checked out Bishop Pass Tarn once more. We then headed down the steep switchbacks of the headwall. It was amazing how much faster we hiked going downhill! We decided that we should do this more often from now on. 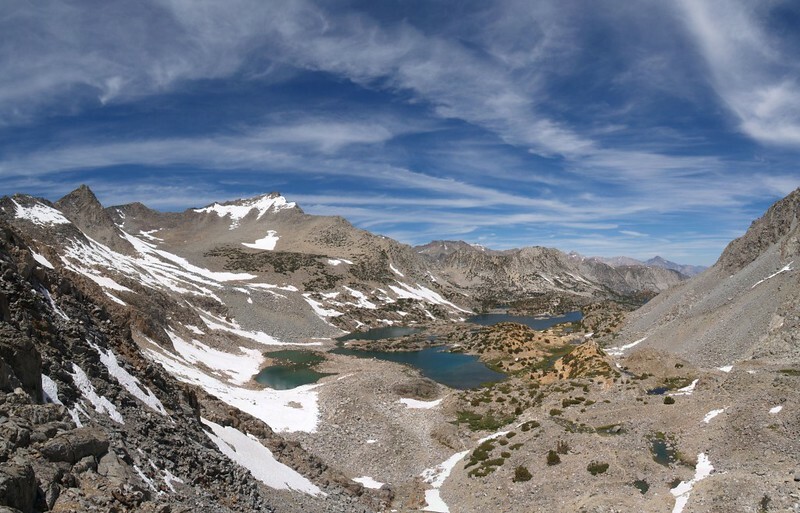 Along the way, the views of Bishop Lake were excellent, similar to the ones we’d had yesterday. We took a rest at the bottom of the switchbacks and discovered that Vicki had lost her “buttpad”! (A buttpad is a small piece of impermeable foam that we carry with us in order to protect our butts from cold, hot, wet, and icy places to sit.) 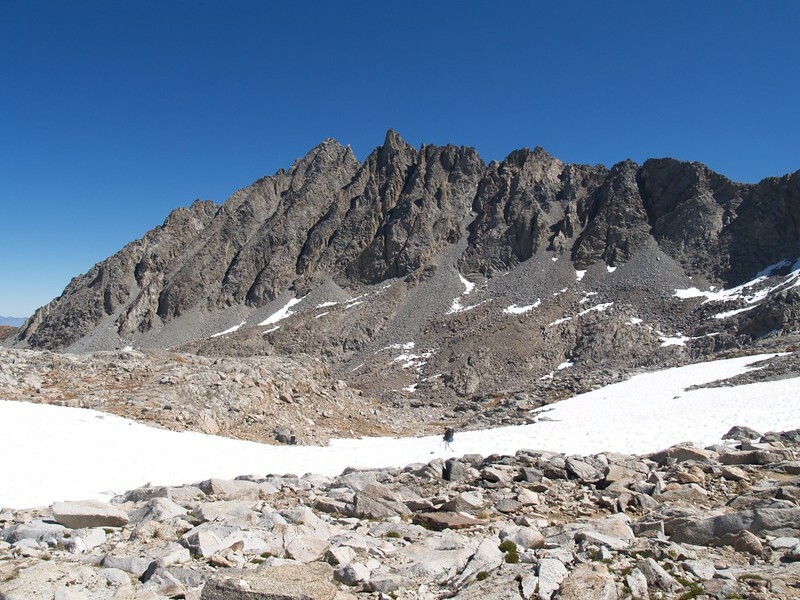 She thought about the last time she’d seen it, and decided that it had been left on a snowfield near the pass, way above the steep switchbacks. She was quite distraught. Not for the loss of a piece of foam, but because she’d inadvertently left some junk out in the wilderness. We were off-trail at the time, and it wasn’t likely that anyone would find it in the near future (i.e. this year), and so it would degrade in the sun and become garbage that someone else would have to haul out. Or not haul out, which was worse, somehow. We are firm believers in the “Leave No Trace” philosophy in regards to the wilderness, so this was a sad thing to contemplate. But climbing back up there and having to find it was more than she was willing to do. It might take hours, and it was windy up there; the ultralight pad might have blown anywhere by now. 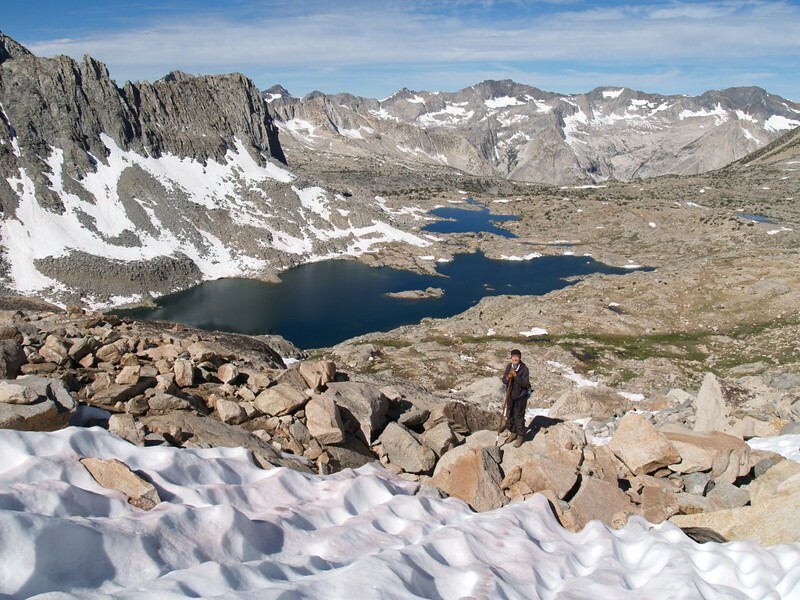 So, with heavy hearts, we hiked on, feeling guilty about despoiling the Sierra we loved. We had noticed, as we hiked down the headwall switchbacks, that there was some sort of cabin next to one of the tiny Bishop Lakes. It wasn’t too far from the trail, so we decided to drop our big packs and head off to discover it, and hope that we would find out what on earth a cabin was doing way up there in the middle of nowhere. And we did! 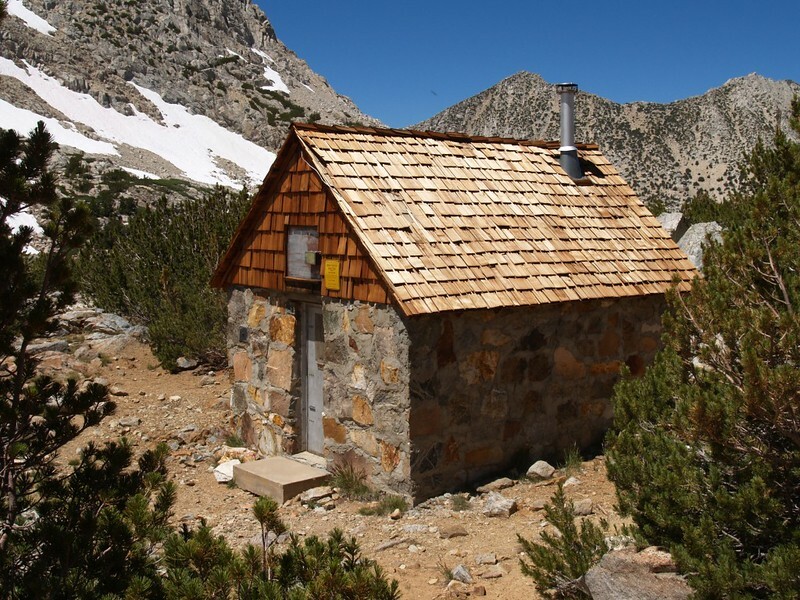 It turned out that it was a cabin built for the Sierra Snow Survey crew, who ski out there in the winter to measure the snowpack before it begins to melt in the spring. This would be a welcome refuge for such a crew. Interestingly, the cabin had two doors, with the main one being bolted shut while the tiny upper door above it had the lock. It appeared that the snow was usually so deep up here in late Winter that it was easier to find and enter the upper door! Opening the lower door would only serve to let in an avalanche of snow. Mystery solved, we headed back to our big packs and continued hiking. And, luckily for us, we met up with our friend Casey, who was in the best of moods, having completed his summits in fine style. 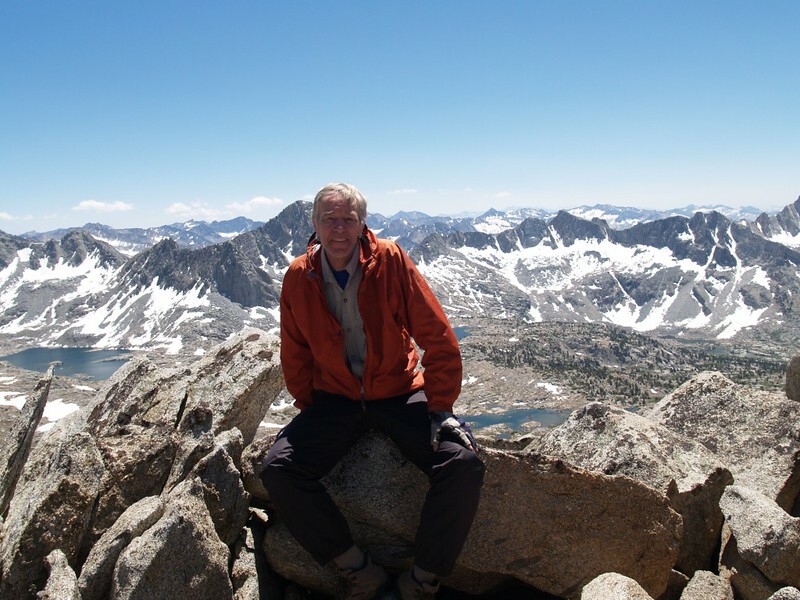 He was now one of the few peakbaggers to have completed the list of all the fourteeners in the lower 48 states. We offered our congratulations, and asked what he was going to climb next. He had to think for a while, and didn’t come to any firm conclusion, except that he swore he’d never climb anything with scree ever again! If it wasn’t good solid rock, or at the worst, large stable talus, then he wouldn’t waste his time. We all laughed at that. 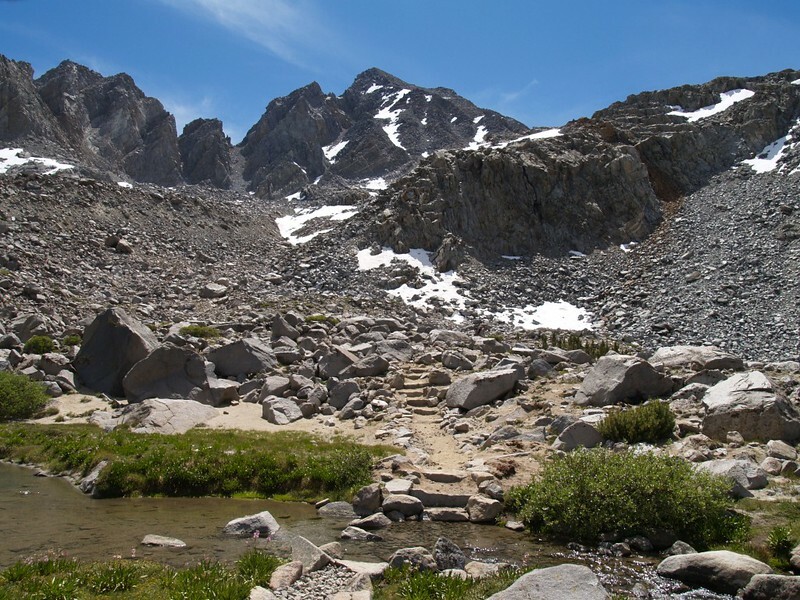 It was a great resolution, because scree is both dangerous and unpleasant; it tires you out, like hiking in deep sand, and your shoes get filled with gravel. 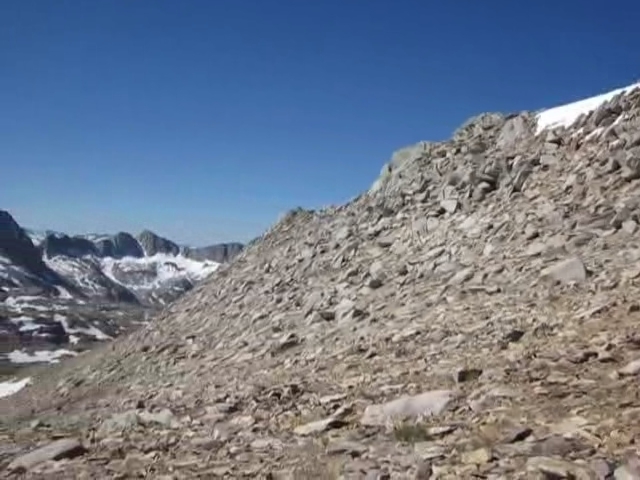 Scree climbing was where the phrase “Two steps forward and one step back” originated. Sadly, we didn’t talk for long, as he wanted to get back to town for dinner, and had a plane to catch the next day. Goodbye and good luck, Casey! After that, we hiked along in easy style, heading downhill, passing Saddlerock Lake, the Timberline Tarns, and Spearhead Lake. When we reached Long Lake we took a break It was still fairly early, and we’d come to another decision-point. Did we want to take the alternate route, up and around Chocolate Peak, camping at Ruwau Lake or the smaller Chocolate Lakes? We took out the map. We’d have to hike uphill to get there. About 300 feet to Ruwau, and another 300 to the others. I was up for it, but was Vicki? Unfortunately, the answer was no. The afternoon sun was too warm to climb a west-facing trail. And so we set our sights on the lower end of Long Lake, so that we’d be as close to the car as possible the next morning, but would still have a nice view for our campsite. As we hiked along the lake we were surprised to see two young men kayaking up the lake! Soon enough, we came upon a few others, but these guys were carrying their kayaks on their backs! We had to ask why; our curiosity was killing us. And one of them stopped to talk and put down his load. He’d traveled here from Australia (where it was Winter now) in order to undertake what could only be called a Journey of a Lifetime. 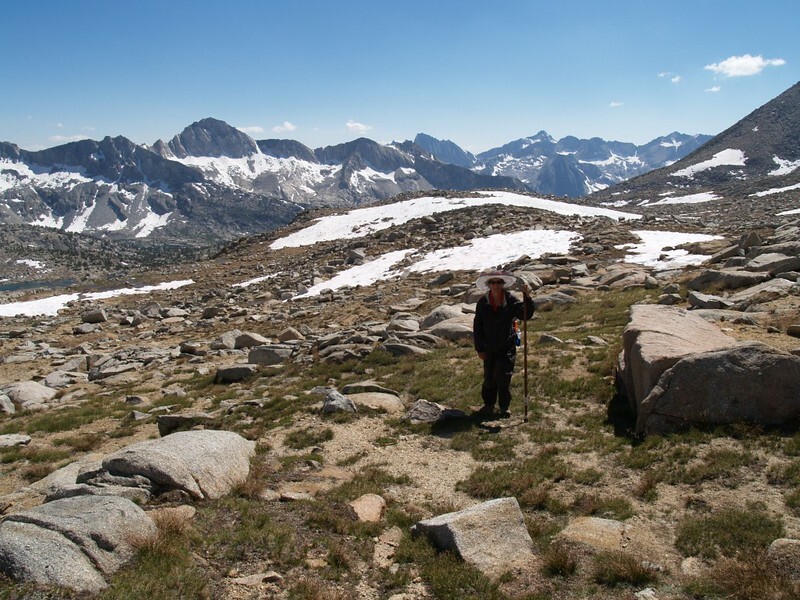 He and the rest of his group were going to carry their admittedly short and stubby kayaks (which were packed full of food and camping gear) all the way over Bishop Pass and down into Le Conte Canyon. 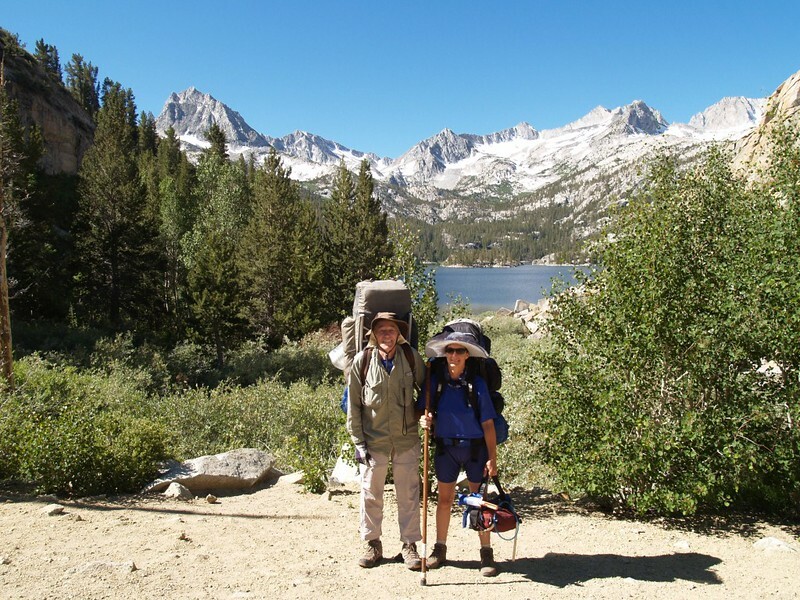 At that point, they would take to the water, and kayak down the Middle Fork of the Kings River, which was running very high with the huge snowmelt during this big snow year. The rapids would be dangerous, even deadly, but they were set to have the time of their lives. And they knew it. The grins on their faces told it all. And they were grinning despite carrying ninety pound loads. Uphill! They were maniacs! But happy maniacs. Shaking our heads in amazement, we hiked on. We eventually found a nice spot to camp, away from the main trail, around the corner toward the outlet of Long Lake. We set up the tent and tried to take a brief nap, but the tent was too hot in the sun. So we decided to dayhike around the area. We traveled downstream a ways, checking out the flowers in the meadow, and then we got ambitious. We climbed up on a ridge and got some excellent views of South Lake from that lofty perspective. So, as you can see, Vicki wasn’t against climbing; she was against climbing with a heavy backpack! When we got back to camp we were happy to discover that the shade of some trees was on the tent, so we went inside to avoid the mosquitoes. They were pretty bad down here near the water. And there wasn’t enough wind to drive them away. Vicki wasn’t happy at all when the time came to go out and make dinner, nor was I when the time came to go out and eat it, but we survived, swatting the bugs and waving at them constantly. We “got” more of them than they “got” of us. After dinner we walked along the lakeshore, taking photos of wildflowers, lake reflections, and of Chocolate Peak. And then we went to bed early. I don’t want to admit it, but the mosquitoes won in the end, and drove us, retreating under fire, into the screen-lined tent for the night. Day 6 Summary: We woke up extra early to an icy coating on the inside of the tent. Brrr! A few mosquitoes made a half-hearted attempt to bite us, but our multiple layers of clothing foiled them. We ate some hot breakfast and packed up quickly. Then we enjoyed the short downhill hike to the car, arriving at 9:30 am. We still had more high-altitude adventuring ahead of us later on that day in the White Mountains. But first we needed to head for Bishop to do some laundry, and take a shower if we could find one. After getting to bed so early, we also woke up extra-early. At first light, well before dawn. And it was cold. Icy cold. I got dressed in multiple layers of clothing and went outside with my camera, hoping to get some photos of lake reflections before the breeze picked up, and, as every photographer knows, dawn was the only time to do it. On the way out the door I discovered that the condensation from our breath had coated the inside of the tent’s tarp, where it had promptly frozen. 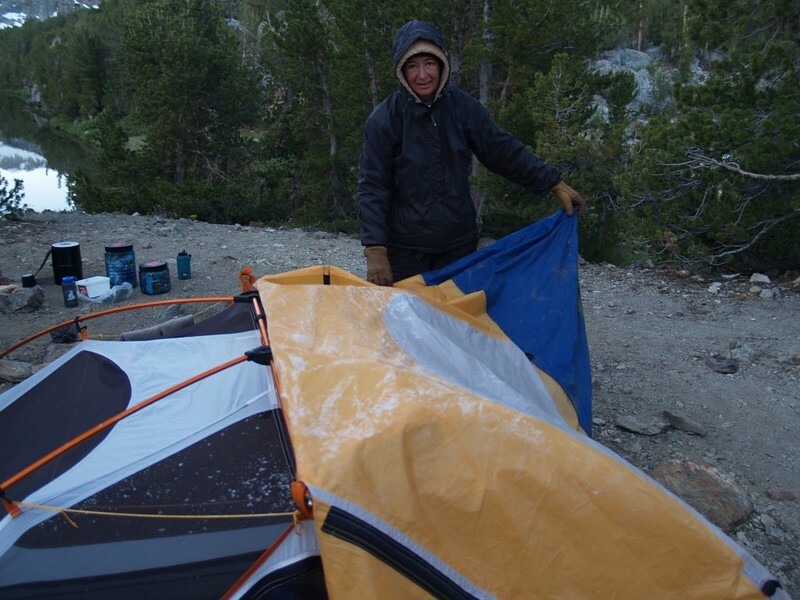 The tarp was stiff and crinkly; it made crackling sounds as I pushed it aside to leave. Vicki was much less excited about the cold, and she had more layers of clothing to to put on, so she came out later. Soon enough, we were drinking hot chocolate and eating breakfast. The ravenous mosquitoes of the night before were in abeyance, either frozen solid or in suspended animation, and we didn’t get much trouble from them. But there were still a few of them that were made of a hardier material, and they were hungry! They swooped down from the trees and landed on us, but we didn’t care: We were wearing too many layers of clothing, with gloves and hats and hoods, and we were impervious unless they landed on our faces. They tried. They failed. We smiled. But then we got to work, getting everything packed away before the sun came out. 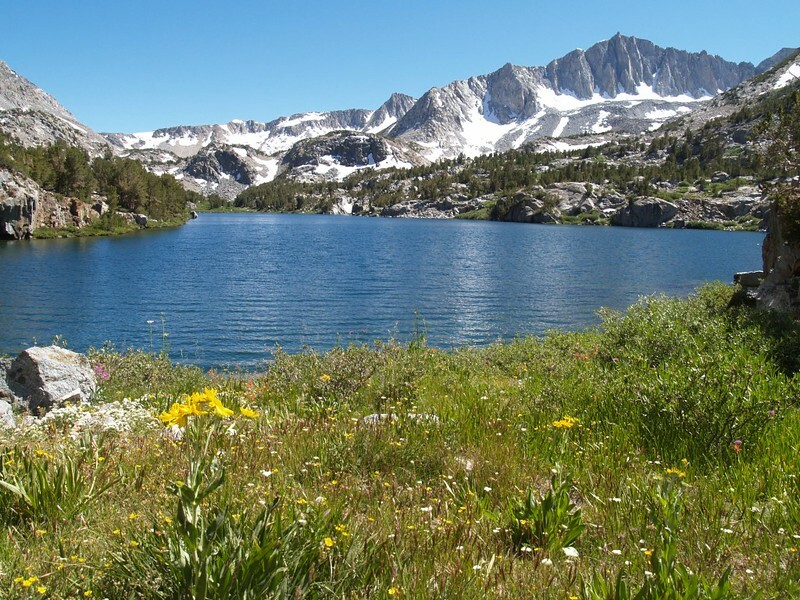 Once we were hiking we’d be fine, because we could out-hike them, and we’d be away from the lake where they spawned. It was our earliest start of the trip. 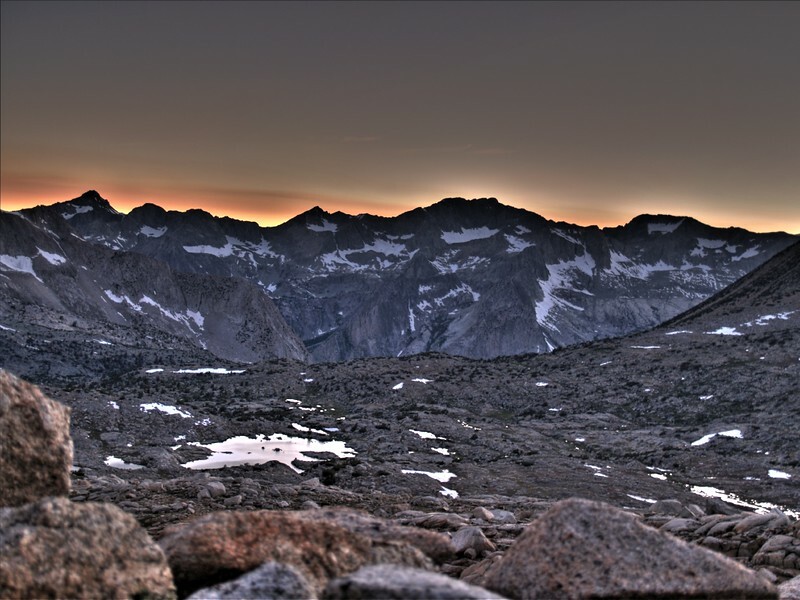 We began hiking long before the sun rose up above the north ridge of Cloudripper. And we made great time. We cruised downhill through tall pines and then hiked along the shore of South Lake, where we saw several early morning fishermen out in their boats. It was a very peaceful scene. As it turned out, we only had about two miles to hike! Super easy. We were back at the trailhead in just over an hour. In fact, we were so early when we arrived that we ended up waking some folks that were sleeping in the parking lot behind our car! They grumbled a bit at having to get up, but they knew that they were merely slacking off at that hour. The sun was already up! And didn’t they know that it was time to get hiking? We spoke with them for a while, and told them how much snow to expect at Bishop Pass, which was welcome news. They were also happy to snag our parking spot. After that, we loaded up the car and drove on down the highway toward Bishop. But we didn’t get far: We saw a building with a big sign saying “Ice Cream” and had no choice but to stop. And it tasted great! Exactly the sort of treat that we needed after six days with nothing to eat but freeze-dried food. Life was good again. After that, it was off to Bishop, and onward to further adventures. 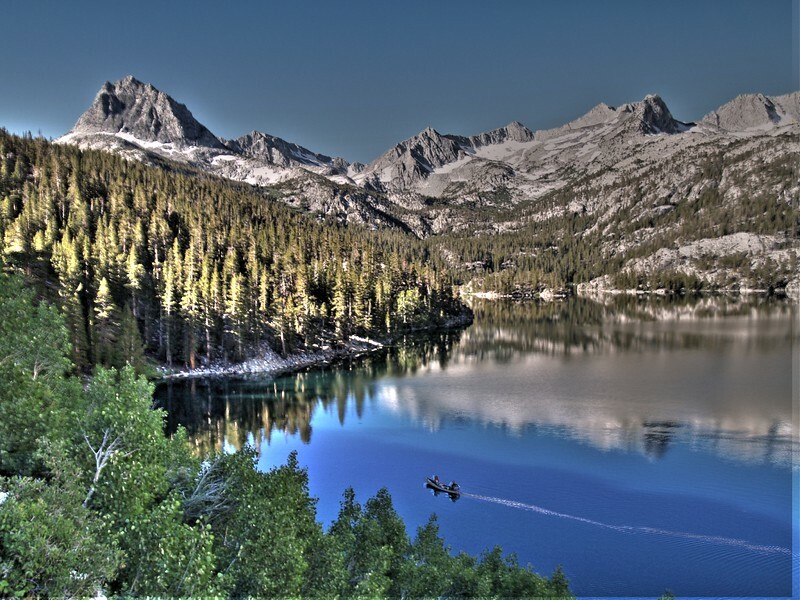 Conclusion: It had been a relaxing and beautiful six days in the High Sierra. For even more photos and videos please check out my Flickr Page.